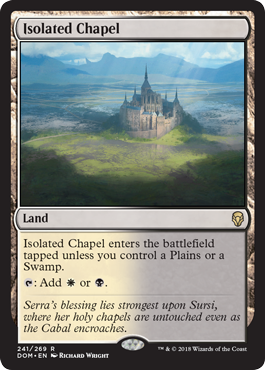 I am so excited that we are going back to Dominaria! 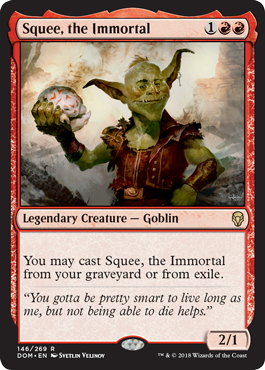 My two favorite Magic characters are Squee and Karn who both make a return in this set. 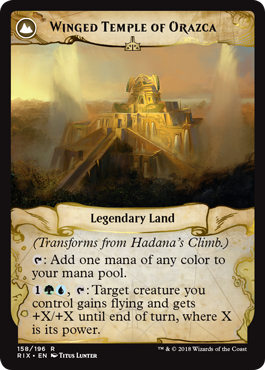 I am also excited to explore a new limited format and play with some new mechanics. After my first set review, I received some much appreciated feedback. My goal is to make this set review more in-depth than the last one, trying to expand on my thoughts more than I did last time. In all honesty, sometimes I am not sure how to rate a card and it takes me a while to figure out what role it might fill in limited. In these cases, I definitely feel that my reviews can be lacking. However, I believe that is the challenge that comes with set reviews – and I am up to the challenge! 5.0: Bomb rare. Will swing the game closer to your favor even if you’re behind. Gains you major advantage when played and not easy to deal with. 4.5: Very good rare but can be dealt with/played around and might not be able to catch you up from behind. 4.0: Solid rare, great uncommon. Increases the overall power level of your deck with its good card quality. 1.5: Cards (usually commons) that are not really cost-effective but might serve a specific purpose (i.e. a wall that blocks so you can go into the late game). This is your very average combat trick. +2/+2 until end of turn for 2 mana and some additional bonus is almost expected in most sets nowadays. 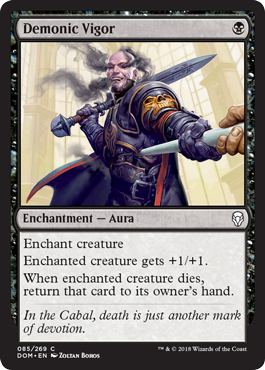 There is usually room for one of these tricks in a deck and since this card specifically gives indestructible, there are times you can blow out your opponent in combat or counter their removal spell. There is always a card similar to this in every set. It will usually see play for reasons such as, “filling your 4-drop slot” or “an evasive attacker/blocker”, but nothing particularly exciting. This card’s abilities and its stats are okay but I don’t find them too exciting to be honest. The ability helps when you are being swarmed by creatures but when you are getting hit by one or two (which is usually the case in limited), the ability is not as effective. 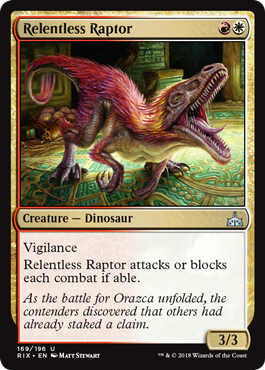 A 4-drop 2/4 with vigilance is about average stats on a creature in limited as well. 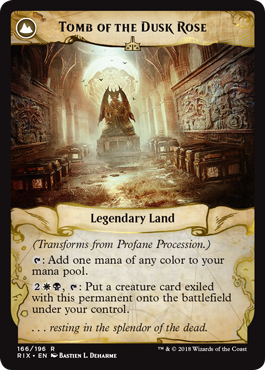 What I think the most exciting aspect of this card is that it is a Legendary Creature which is a big deal in this set. Put all these things together and I think this card is slightly above average. 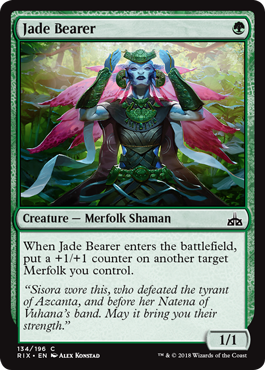 I suspect that this card will be a 2/2 creature most of the time and that is perfectly average for a 2-drop. The few times it gets the bonus, it can maybe trade up for some value too. Anthems have always been a strong effect, especially in limited. 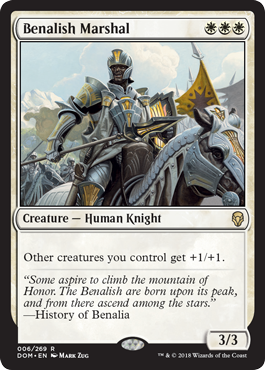 To take full advantage of the anthem effect though, you need to have a lot of creatures on the battlefield which goes well with the strategy of making Knight tokens. 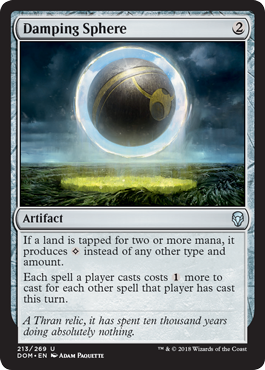 Since this costs triple white mana to cast, it probably won’t be cast on turn 3 most of the time, but you don’t really need this card until you have established a good board state anyway. 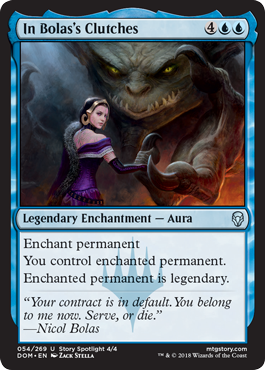 Unconditional removal with a couple options built in is good. 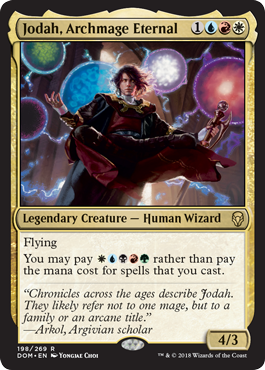 However, I think there is a limit on how many of these I would want in my draft deck because of the mana cost and I would say that 2 is probably the maximum I would put in a deck. 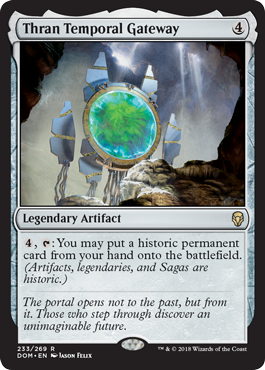 I am giving this card an average grade on the assumption that there will be decks that are built around having a lot of historic cards. These cards are tough to give grades for though because they will be great in some decks and useless in others. 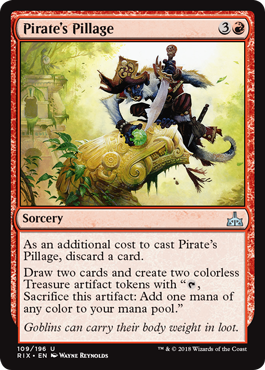 The best time to have this card is if you have a powerful rare/mythic rare in your deck that will win you the game 90% of the time if cast and you need ways to get to it into your hand faster. 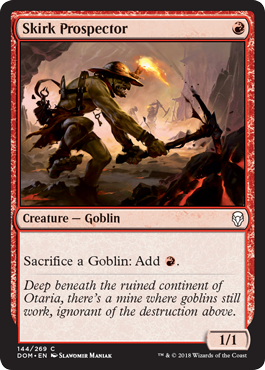 While this card seems about average for its mana cost, I think it has a lot of potential to be better than that. 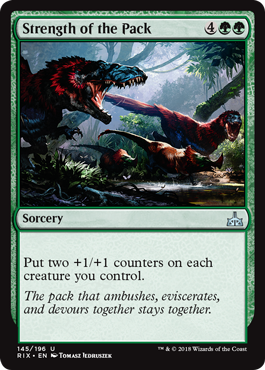 There are some synergies with having multiple creatures on the field and 2 bodies is almost always better than 1 in limited. 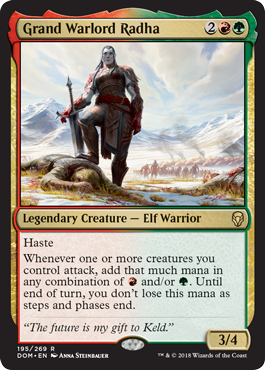 Speaking of synergies with having multiple creatures, this card is definitely hoping you have some creatures on the battlefield. 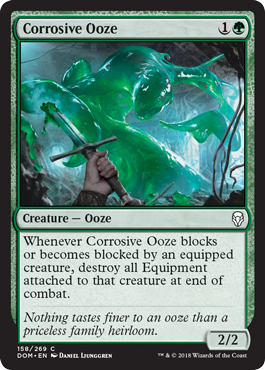 Since it is cheap to cast though, if you only have 1-2 creatures on the field, it can be used as a combat trick rather than a mini Overrun effect. However, I think there are better cards if you are looking for combat tricks. 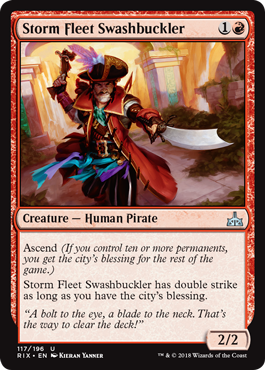 This card will be very strong in the R/W equipment archetype, but it is also quite strong on its own. On top of that, it is a historic card. This is a strong card, but it is not the exciting rare that I would hope to open. It requires you to play certain types of spells in your deck to get full mileage and the best rares are the ones that operate well on their own. 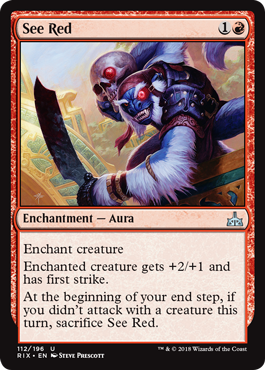 If you have this in your opening hand, you can always go aggro and play it turn one. But if you draw it late, it can be really annoying for your opponent to deal with. Good early and good late usually means that it’s a good card. 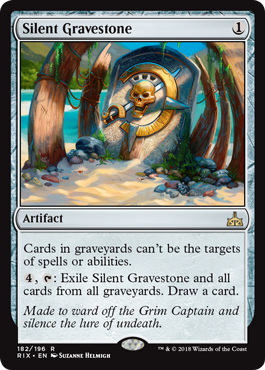 Unless you are expecting to cast historic spell after historic spell, this won’t be the Territorial Hammerskull that you are looking for. 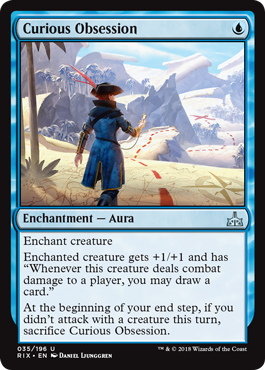 However, it is an all-around average card and your opponent does have to respect it when they are behind. 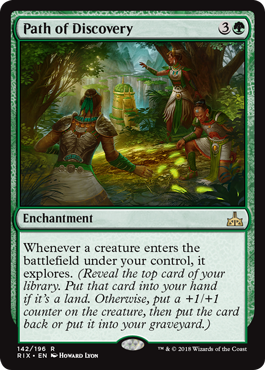 This card turns almost any creature into a threat and it can be especially effective on the creatures that are part of the archetype of looking to be equipped or enchanted in this set. 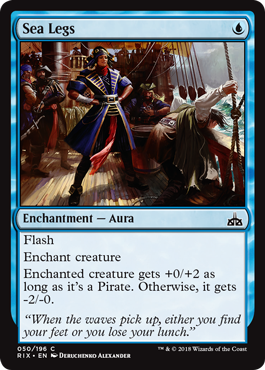 While auras are typically avoided because of the fear of getting your opponent getting “2 for 1”, we have learned from Ixalan block that sometimes auras can also run away with the game. 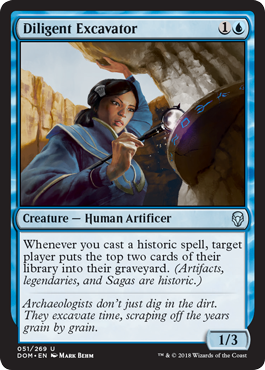 Similar to Daring Archaeologist, I think this is a strong card but not a rare that I would be really excited to open. I feel like it needs a lot of things to go right before you see it do fun stuff. At the end of the day, 4 toughness is not unbeatable. This card is what I would consider to be filler. 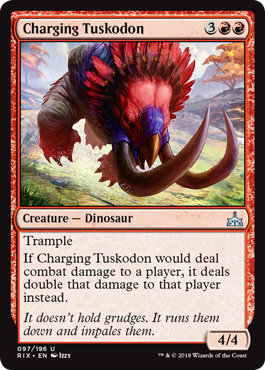 They even made it a creature type that is irrelevant in this set. 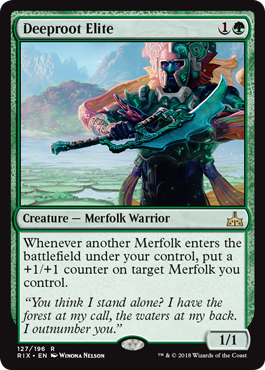 However, it can be an annoying card for your opponents to deal with because only about 15% of creatures in this set have greater than or equal to 5 power. I am not sure when or even why you would want this card in your deck. 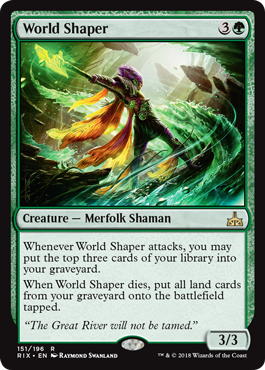 I can see it maybe being good in green/white where you can play this and ramp faster than your opponent with your other creatures/spells. 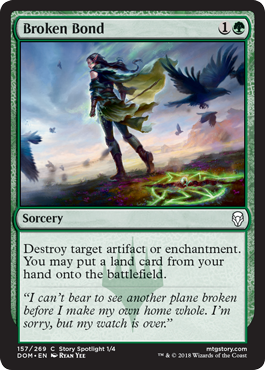 I can even see it maybe being good against the green decks once they have churned out most of the lands in the deck. 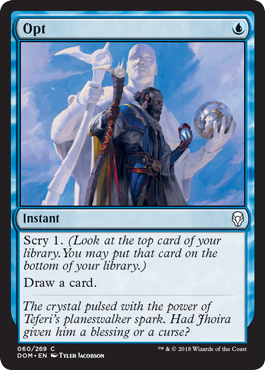 But ultimately, you want to be doing other things in limited than trying to mana screw your opponent (especially because mana screw just happens naturally in limited anyway). 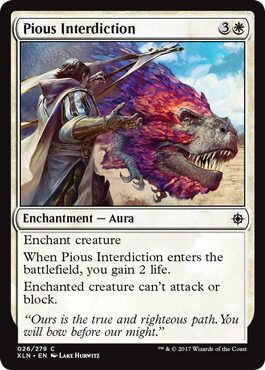 A good conditional removal spell where the only condition is that the creature interacted in combat in one of two ways. 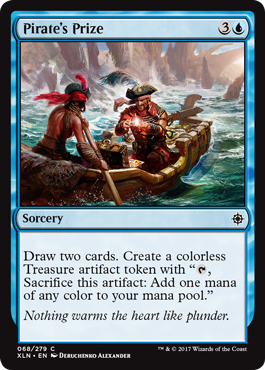 It is also cheap to cast so I wouldn’t mind putting 3 in my deck if it’s one of my only ways of interacting. While this card might seem similar to Dive Down, it is a lot worse than Dive Down. One reason why is because only being able to prevent 3 damage does not cover all the spells that could be trying to get rid of your creature. You might think that it can be used as a combat trick and be profitable for you when a creature might have traded off otherwise, but that requires set up and is situational. 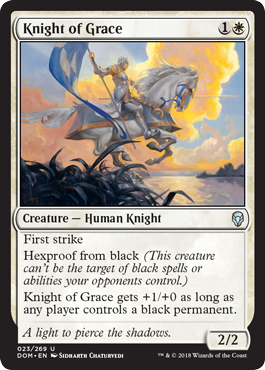 It is very different from giving a creature +2/+2 until end of turn because that can push through damage for a lethal attack whereas Healing Grace is defensive. I think this is a solid rare to open. 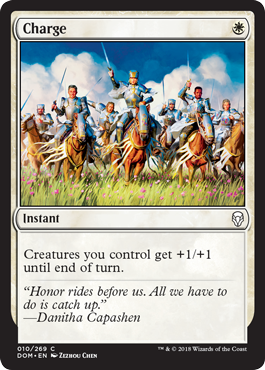 On turn 5, you can attack with at least 2 4/3 vigilance Knights and while that isn’t necessarily game ending, it is still a strong turn 5. 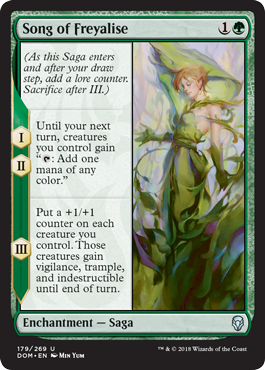 Another good aspect of this Saga is that it has an effect on the board state as soon as you play it. 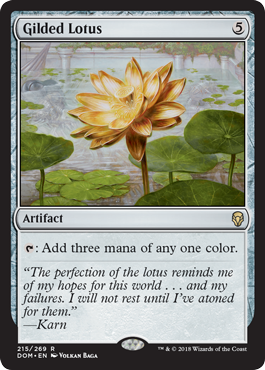 Normally, I would give a card like this a 0.5 sideboard grade. 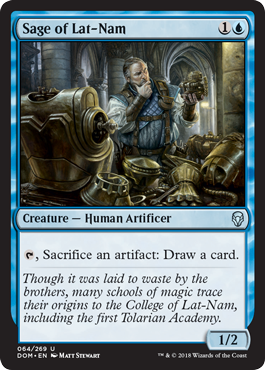 However, as this set has some focus on artifacts and enchantments, I almost would think that you would want one mainboard, just in case. Either way, it seems to be worthy of a higher grade than 0.5. This cycle of cards used to get Protection instead of Hexproof. It is a downgrade from before but it is still a good card overall. I kind of want to give it higher grade because this is much better than most 2-drops but having Hexproof instead of Protection is a 0.5 point difference for me. 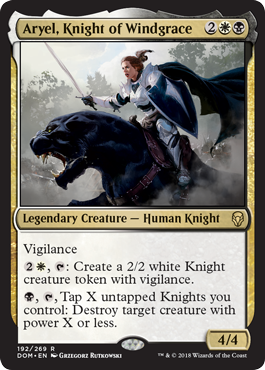 This is basically Raptor Companion but in Knight form. Usually the purpose of putting this into your deck is to fill out your lack of 2-drops and maybe get in some damage if your opponent doesn’t play their own 2-drop. Though the card quality is about average, I usually give these cards a slightly below average grade because they are a lot worse than 2/2s when you are facing 1/1 tokens (which there are in this set). 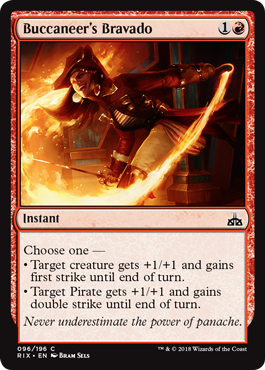 Having the ability to give first strikers double strike is kind of irrelevant unless you have a lot of first strike creatures. It does have decent stats though and is a historic spell. A very powerful creature to play on turn 5 and any turn after that, to be honest. 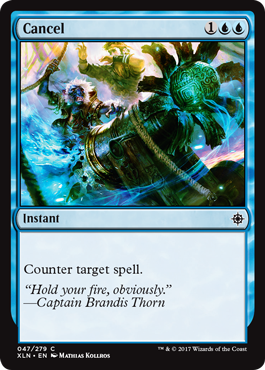 If you don’t have a removal spell when your opponent lands this on the battlefield, you’re going to have a bad time. 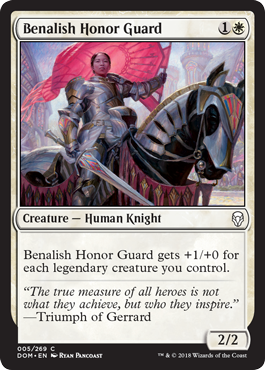 A Bishop Soldier that doesn’t belong to any tribe is still good, but not Bishop Soldier good. I think it will end up being average in this set, although the lifelink is a nice bonus. 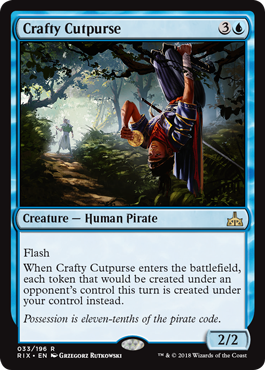 This card can swing games very fast depending on the creature you put it on. A very big creature getting lifelink and flying is always a good threat to have. However, you also put a huge target on your creature to be dealt with in which case you would be down an extra card to your opponent. I think the risk is worth it most of the time, but I would definitely pick my moments with this card. 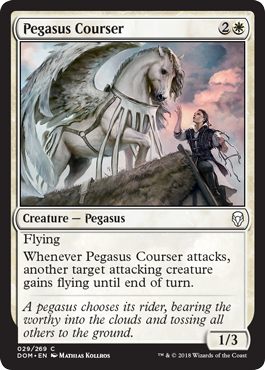 I suspect this card would be best in green/white decks where you can have this Pegasus give a big creature flying alongside it. 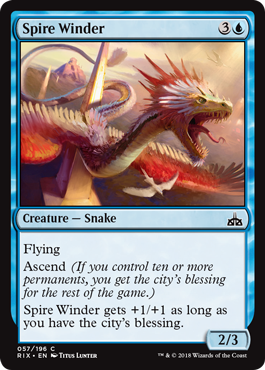 It still plays a good role in other decks though and I am always a fan of blue/white flying decks in limited as well. Overall, it is pretty average though and I wouldn’t want more than one normally unless I was building around a specific strategy. 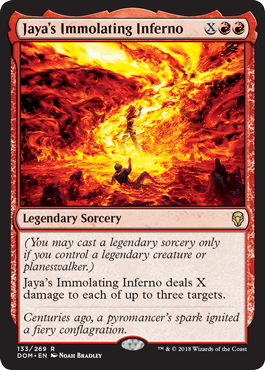 I am not really a fan of this card… I would almost always offer the trade and see if my opponent would discard a historic card to give it indestructible. Either way, you’re still getting one for one. Overall I think it is about an average card. 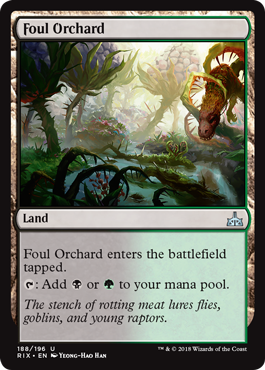 Conditional removal but it can get rid of almost any creature that is giving you trouble for very cheap. 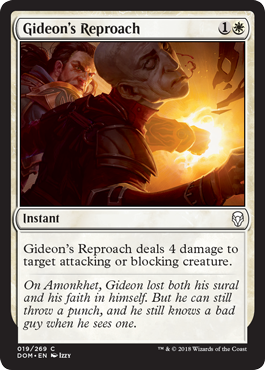 I think cheap removal that can deal with almost anything goes a very long way in making sure you have an answer to an opponent with a cheap bomb rare or a very fast start. Sometimes, you won’t be able to make it turn 5 to cast those premium removal spells unless you have cheap removal that can deal with early game threats. 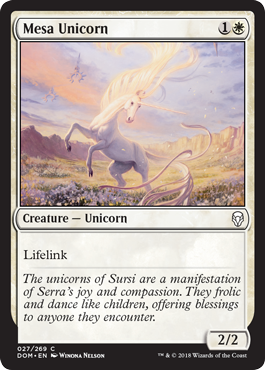 I like this card a lot because it has a kicker effect that you are happy with. 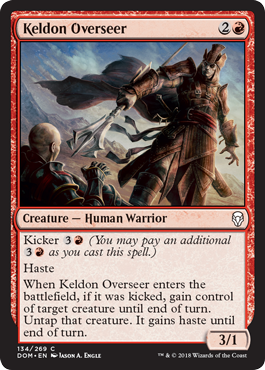 Kicker can make average cards slightly above average such as in this case, but only if the kicker effect is good too. 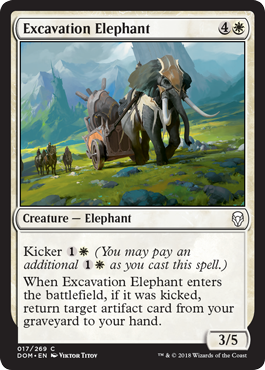 Excavation Elephant has a kicker effect, but it is situational so it is not as good. 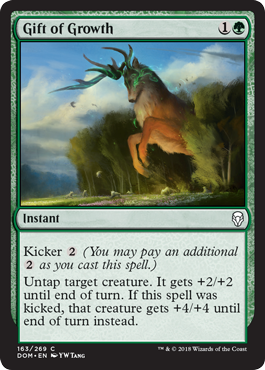 Kicker is one of my favorite mechanics because it is similar to getting two cards out of one if you pay the extra mana cost. 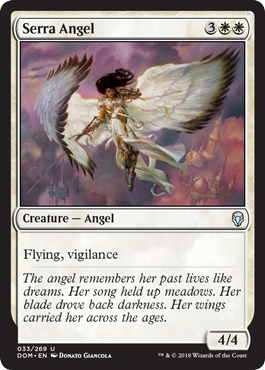 Serra Angel is such a powerful card – if you thought Air Elemental was good, Serra Angel is even better. 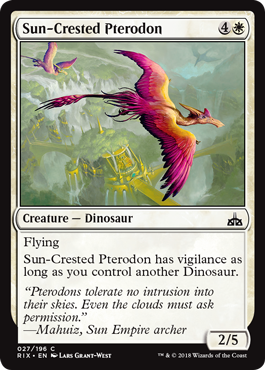 It matches up really well against the other creatures in the set, and being able to hit in the air and block the small creatures on the ground is big advantage. 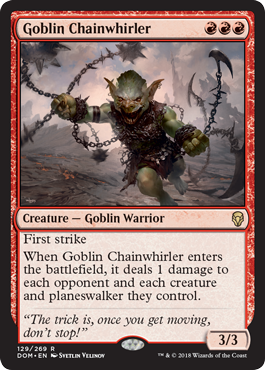 First strike on a 1/1 always makes me a little sad and while I think it is slightly below average, I can see this card doing decent work in some decks. 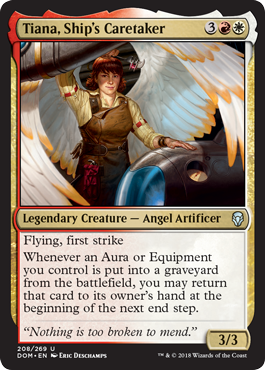 It is a cheap early flier though, which there aren’t many in any given set. This card will have a huge target on its back, but that’s because when you play it, it will be the only thing your opponent can target. This is the kind of rare I would be happy to see and do whatever I can to also be in green so I can activate its second ability. 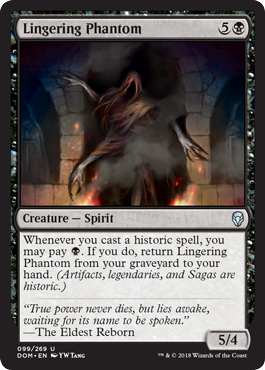 I think even if you cast one historic spell, this card is good. If you can get multiple spells back from the graveyard from though, it is really good. And you can hit for 2 in the air while getting value off your historic spells. This is very fringe playable. 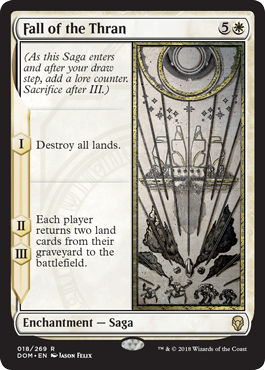 I don’t think this will see play in most decks, unless you really think having the potential to cast your Saga twice is worth making your deck worse. 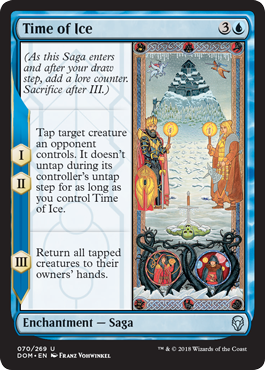 Sagas that affect the board the turn they are cast are usually good and while this one requires a creature to affect the board, it is still pretty good. 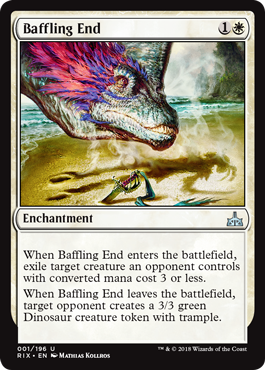 It is also a cheap cost to have a recurring effect across 3 turns, so even if your only creature dies, you didn’t invest too much mana into it. 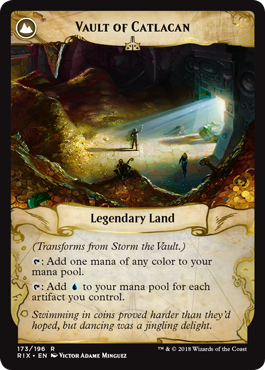 This is a situational board wipe, and while there are a lot of legendary permanents being played in this set, you just need to make sure you’re playing more legendary permanents than your opponent to have it swing in your favor. Another common card that I think gets slightly better with kicker. 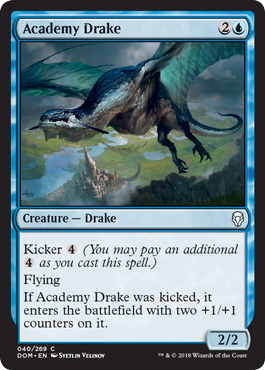 Paying 4 mana to give a creature two +1/+1 counters is an actual card, so this Drake has a fair upgrade price. I am assuming that you are playing this in a wizard deck in which case, it is average. 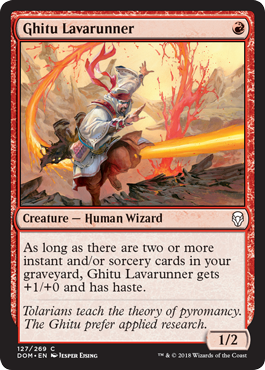 If you are not playing wizards, this card is a lot worse. 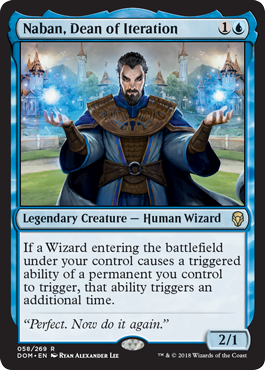 But blue has plenty of wizards, so the chances of you controlling another wizard is good. I like auras that give flying but I don’t really like auras that only give +1/+1. 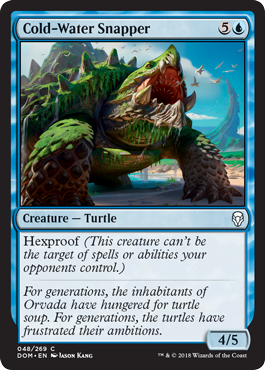 However, if you manage to get it on the hexproof turtle in this set, it might be another One with the Wind + Jade Guardian combo. 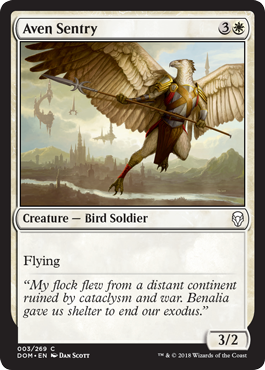 A 1/1 flying for 1 seems like a reasonable card, but I tend to stay away from these because the real cost of playing this card is that you are not playing a different card instead. 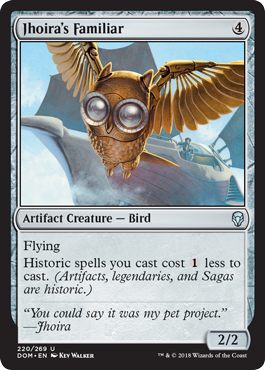 It is not a horrible card if you really don’t have any better cards to play or if you’re really going for the blue/white flying theme but I would not take this card highly. 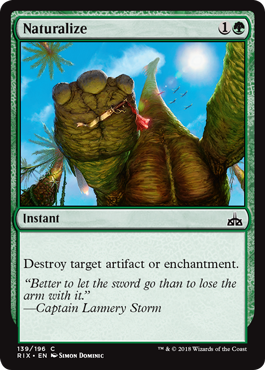 This is not my favorite form of removal as it needs specific power/toughness to line up in your favor. But it does draw a card to replace itself so I think that brings it up to about average card quality. 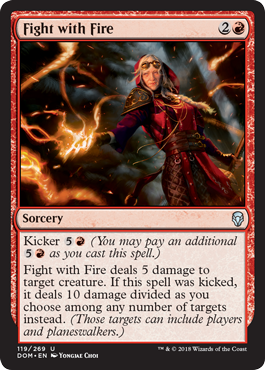 This card is pretty good on its own and adding kicker makes it even better. Side note: the art really creeps me out. 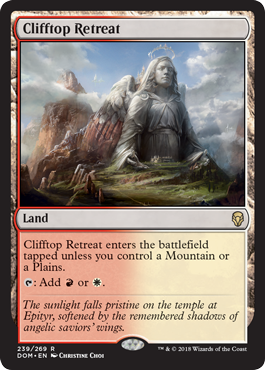 I feel like there is always at least one sphinx in every set. This one is about what you can expect from an average 5-drop creature though. I guess if you desperately needed a top end, this turtle has your back. It also has hexproof which makes it a good creature to put some auras or equipment on. However, it does cost 6 mana so hopefully your opponent is going slow and steady to give you enough time to cast it. 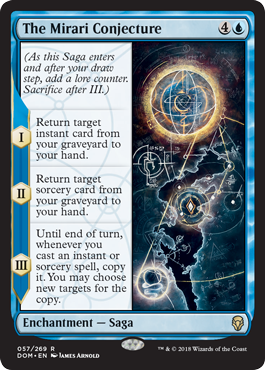 This is an interesting way to cast Divination so it is kind of hard to grade. 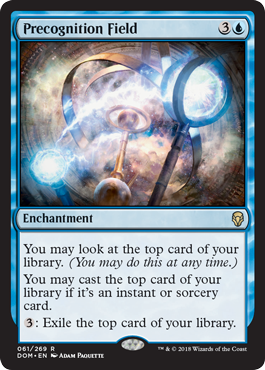 I just settled for giving it the grade that I would give Divination since I don’t believe I would take this card highly in draft. Blue has the strangest removal spells, but this is one of the better ones. While the threat will still be in your way on the board, at least you don’t have to deal with whatever scary thing it was before. 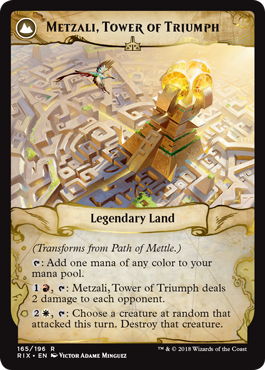 You have no idea how much I love milling and I almost hope for it to be a real way to win in limited. But it is unlikely that the mill strategy is viable, especially since I know there are some green cards that shuffle your graveyard back into your deck. 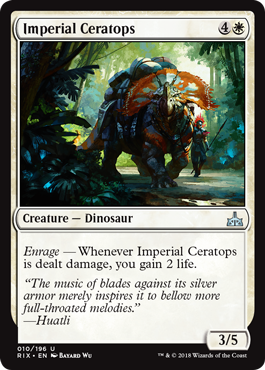 Given that, it is an average 2-drop creature. The common Curator’s Ward is much more direct with the way it allows you to draw 2 cards. 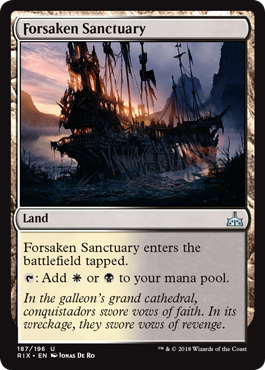 It is good to have access to one of these in your limited decks but I wouldn’t want too many personally since it doesn’t affect the board and the board is very important in limited. 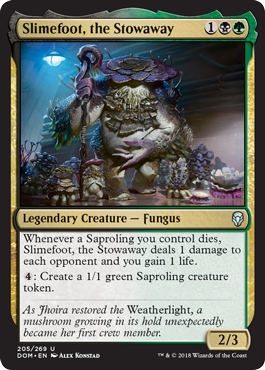 This is your average 4-drop creature and as much as I would like to think that if I picked up 5 of these in draft, then I could mill all my opponents out, I know that is not the case. Try to treat it as an average 4-drop and not a fun challenge. If you are like me and you’re too unlucky to open any bomb rares, you can always just use this card to steal the bomb rares from your opponents. Even if you aren’t after rares specifically, you can just steal the best card on your opponent’s board and hopefully swing the game. It doubles as a removal spell and a threat. 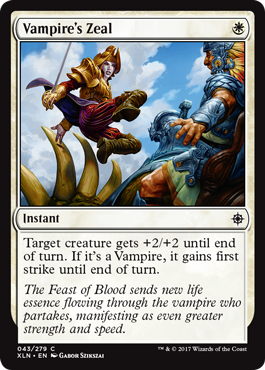 An extra turn means an extra draw step and an another combat step which are extremely valuable in limited. 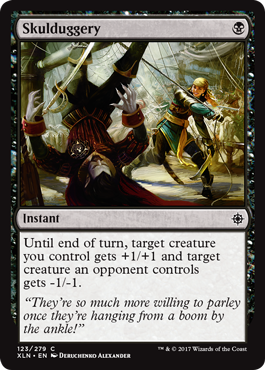 Even if you are behind on board, this card can help give you an extra turn to stabilize. 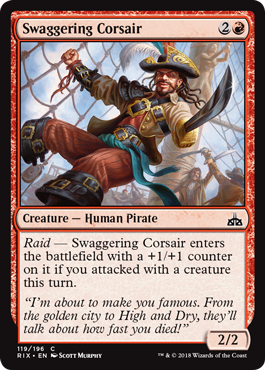 I already feel like I’m going to get blown out by this card in combat or even as a tempo swing. The best part is that you also get a 2-drop 2/2 creature onto the board no matter what. 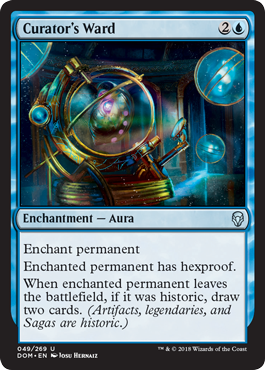 As my friend Zack put it, “it’s a panharmonicon for wizards”. 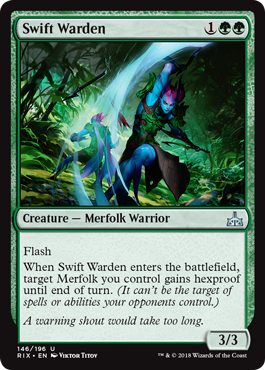 And there are a lot of wizards with triggered abilities in this set so it is definitely a big incentive to stay in wizard tribal if possible. 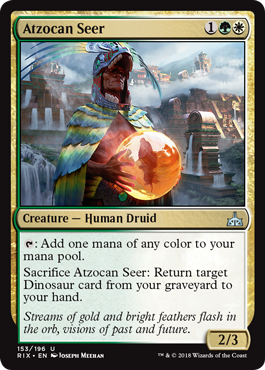 If you thought Naban was an incentive to be in wizard tribal, this card will have you gathering up as many wizards as you can squeeze out of your sealed pool/draft. Hopefully there are enough to make a good wizard deck because she will be very powerful in any wizard deck. 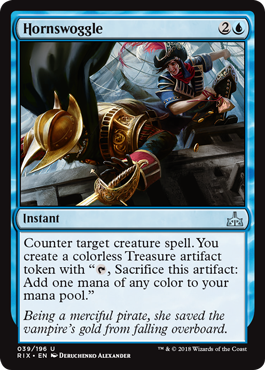 I am personally not a fan of Opt in limited, but I know some people like it to help them hit their mana more consistently. I don’t think it really does that much to be honest hence the low grade. I think this is an okay rare, but it doesn’t go into every deck. I can see it being much better in sealed than draft as well. It is slow but it does give you information and some deck manipulation. This is another one of those 2-drop creatures with upside. 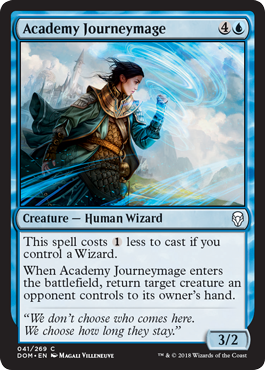 It does seem a little out of place in blue though since it isn’t a wizard and it seems to want to be aggro, but it is an average card nonetheless. I don’t think you would want to play a card like this most of the time. It feels like a really bad filler card. You can maybe save a bomb rare of yours from dying or you could bounce your Saga before it ends to replay it, but I think those are such fringe cases that you would be much better off playing a different card in your deck. 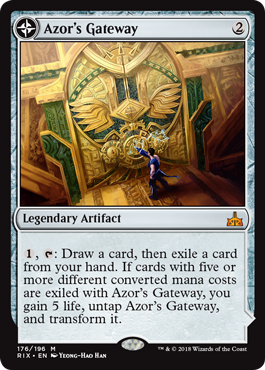 I don’t think there are enough cheap artifacts in this set to make this card good, so I’m thinking it will be below average. 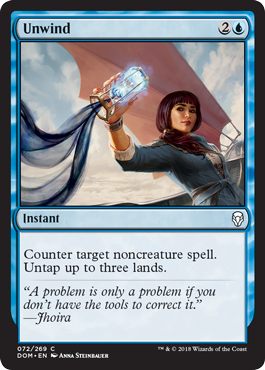 Maybe in constructed it can make some waves, but I don’t see it doing much work in limited. I think if you wanted to reset your Sagas, this is the way to do it. 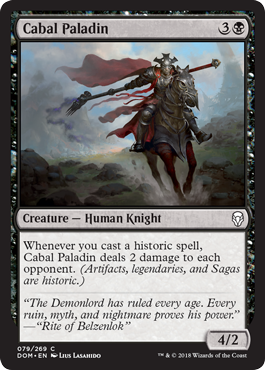 Also it can save your Legendary creatures from removal so it is a solid card all around. I don’t know if I can justify spending 10 mana on this, but if you ever get there, it is definitely powerful. 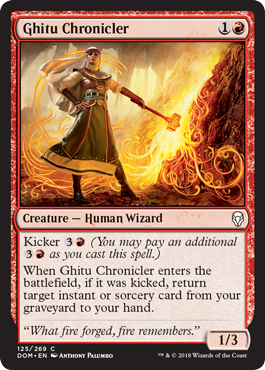 An 8/8 for 8 mana is tough to get to as well so I’m giving it about an average grade since it is about average without its kicker. 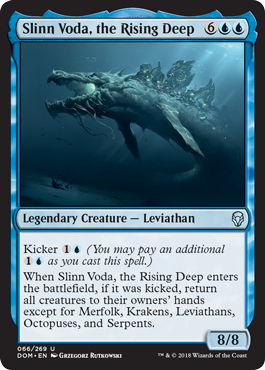 Even with its kicker, costing this much mana will generally receive lower grade. This is not the best counterspell but it can get the job done. 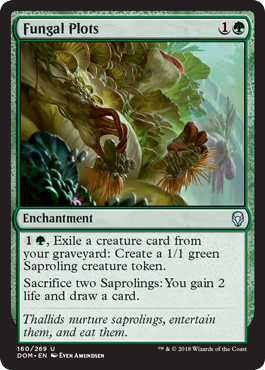 While it is flexible, it can also be tough for your opponent to play around and the exiling is a nice bonus since there is some amount of graveyard recursion in this set. I don’t really expect this card to be cast on turn 3 all that often, but it will be very good when it does come out on turn 3. 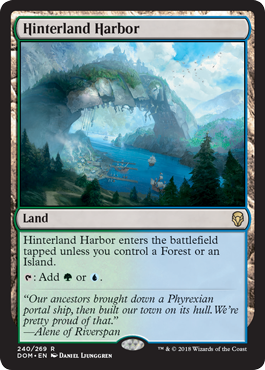 Even so, it is pretty good any turn you can cast it, and the later the game goes, the more islands you will probably control. I like this card a lot. It looks like it can do well in a deck that makes lots of 1/1 tokens. Even if you aren’t going the aggressive route, it is a good blocker on turn 2 as well. 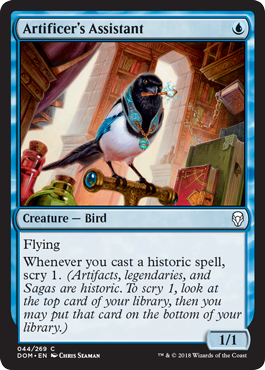 If you have a lot of artifacts in your deck, this might be okay but I don’t think this is the type of rare that I would want to first pick in a draft. It is a lot of set up and since it doesn’t affect the board as soon as you play it, it’s just not the type of strategy that I’m after in limited. 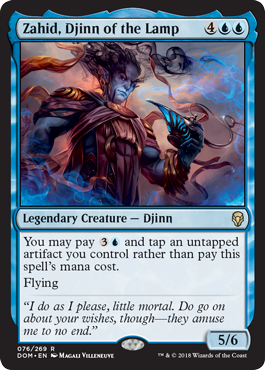 This is relatively strong depending on the power level of the instants/sorceries in your deck. 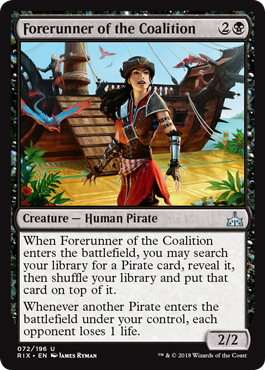 Again, I don’t think this would be a rare I would first pick in a draft, but I do think it can be good once you already have the deck for it. This card gives you a lot of tempo over the course of a couple of turns. It can also make your opponent skip a combat step because their attackers will get returned to their hand once you reach the third lore counter. 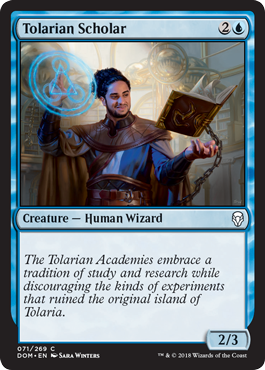 The most important piece of text on this card is where it says “wizard”. But other than that, it is kind of a below average card. 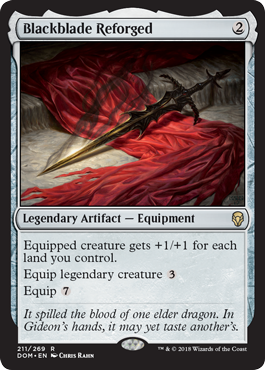 I think you can mainboard one of these cards since enchantments and artifacts are abundant in this set. Since it lets you untap 3 lands afterwards, you can also cast another instant if needed. 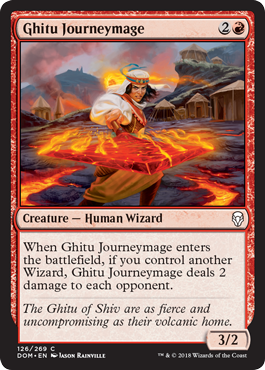 If you are drafting wizards, I would imagine this is one of the common wizards you are hoping to have in your deck. 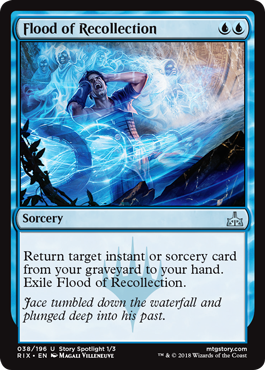 Even without being in a dedicated wizard deck, being able to cast your removal spells ahead of curve can be really powerful. 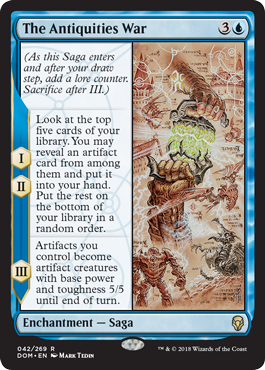 I don’t really think the milling aspect of this card is that important (unless you’re playing a black recursion deck or maybe trying to mill out your opponent), but drawing 3 cards can be really good in sealed. 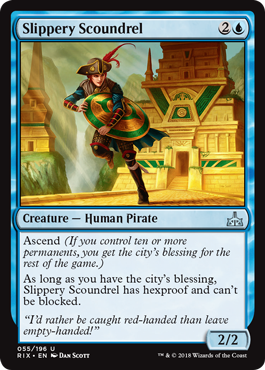 5 mana is kind of a lot of pay, but sealed is also usually a slower format so it’s not a big deal. 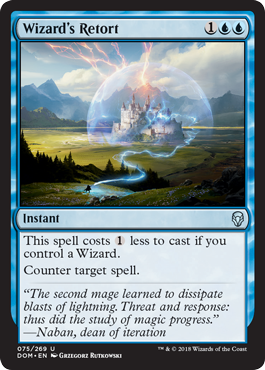 This is basically counterspell in the wizard deck and most decks playing this will have at least one wizard so I almost always expect this to cost 2 mana. 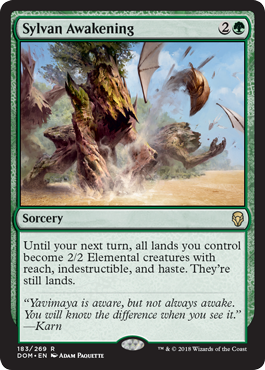 If this comes down on turn 4 and you are caught unawares, then it might be a very fast win for your opponent. 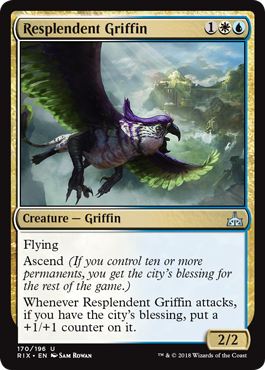 A 5/6 is bigger than most creatures in this set and it even flies! This is a very cheap and good combat trick. 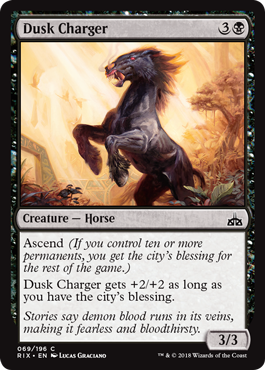 There are a lot of legendary creatures running around as well so the card’s second effect is definitely relevant. 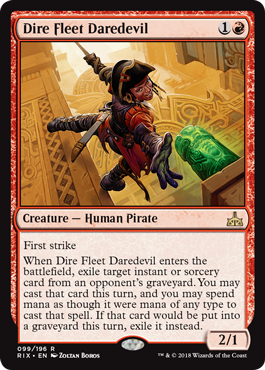 This is the most average a card can get in limited: 2/2 for 2 with a lot of flavor text. I almost want to give these a lower grade but in reality, they are right at the benchmark of where they should be. This card’s ability is trying to make up for its below average stats and it’s not really convincing me. 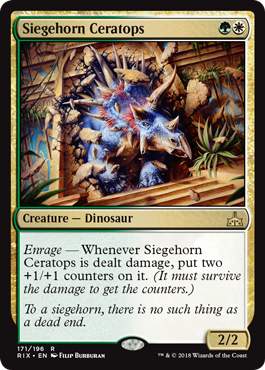 The damage can definitely add up and is a good form of reach if your deck is lacking it, but I think there are better 4 mana creatures to play. 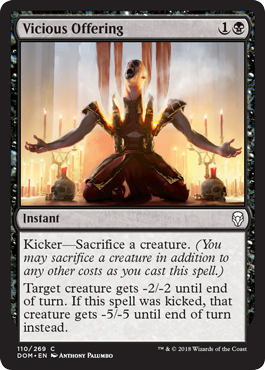 I normally give cards with good kickers a slight boost, and while this is a good kicker effect, there is a high chance that your opponent won’t have any cards left in their hand when the game goes longer. 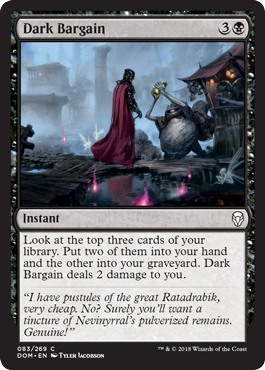 I think turn 6 would be ideal to maybe get something expensive out of their hand, but I don’t think that will always happen. 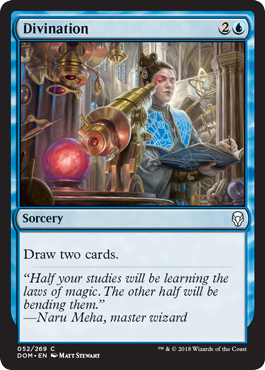 In some cases, you’re getting a 1/3 for 6 mana and your opponent doesn’t discard anything of relevance which makes this card about average for me. Cheap removal is very important to have even if it is conditional. 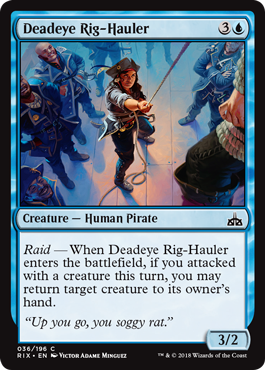 While this won’t deal with the Legendary creatures that are giving you trouble, it can deal with pretty much anything else especially the early game threats. You have to pick your moments with this card, but I think when you find a good time to play it, it will be pretty decent. While it doesn’t affect the board right away, it does affect life totals and eventually gets a creature onto the board. I like to think of this as black’s Divination. There is a small upside in that you get to choose which cards you want but it is all balanced out with mana cost and being dealt 2 damage. 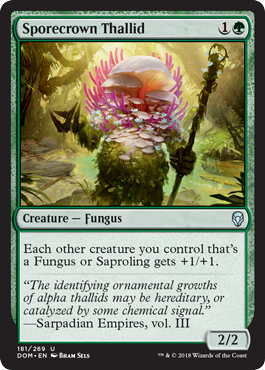 I think the Funguses are going to be great in limited. 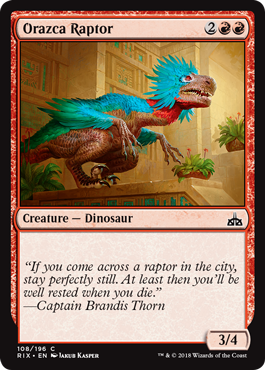 I also really like creatures that leave behind tokens when they die. 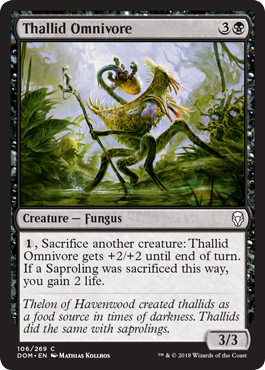 There is a lot of value that can be generated from creatures like these, such as they make great sacrifice fodder and they also trade off well. This reminds me of Unnatural Stamina but your opponent can see it coming. I wouldn’t always play it but it can make an annoying threat even more annoying for your opponent. 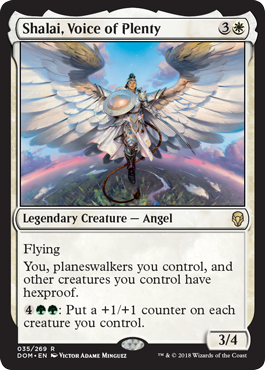 Even if you don’t get to repeat the process, this card is still a 6 mana 6/6 flying trample Legendary creature that let you draw the next spell from your deck which is bad enough to deal with. If you do get to repeat the process, I think you will be well set up to win the game. 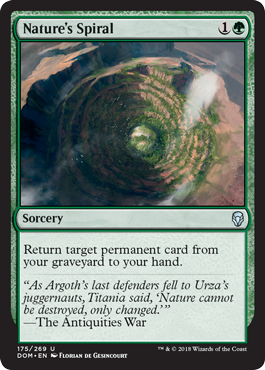 If you play this turn 1, you will almost always hit in limited since the majority of limited decks are creatures. But it does get a lot worse in the late game when your opponent is probably holding mostly instants/sorceries in their hand. 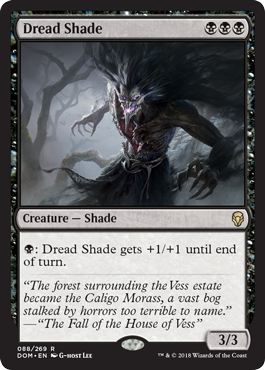 Shades are some of the scariest creatures in limited to me – not because they’re horrifying creatures but because they are great mana sinks for my opponent. It’s not likely that you can cast this on turn 3, but if you can, you will be potentially attacking with a 6/6 on turn 4 which is very hard to deal with. 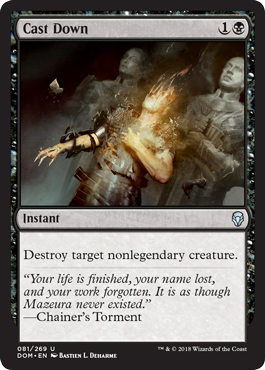 They got rid of “regenerate” and changed it to a different phrasing. 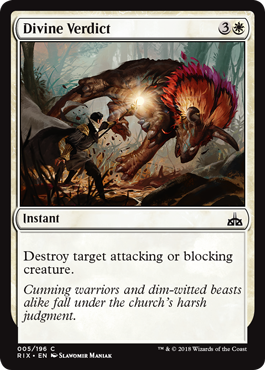 Regeneration is a powerful ability in limited because you can block big creatures that don’t have trample very easily by only paying the regeneration cost. However, you don’t want too many of these since they are defensive cards and you do need to win the game somehow. 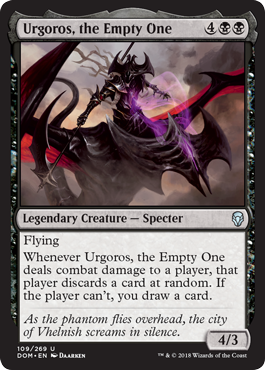 Unconditional removal is always good to have and this one is even easier to splash than Impale. 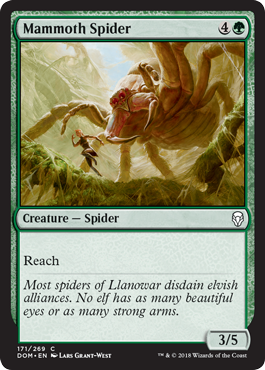 A creature this big usually doesn’t have deathtouch but here we are. I think it will be a decent creature to cast on turn 6 but costing 6 mana is a lot. I don’t really like these cards since they cost a lot and you are taking a turn off to set up something. 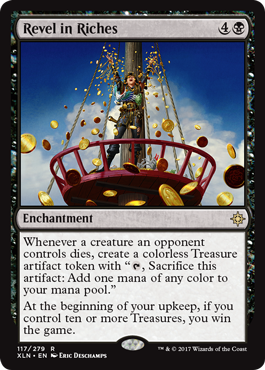 Whatever you are setting up has to be worth the opportunity cost of a losing a turn so hopefully the cards you are getting from your library are powerful enough to make up for that loss. Typically though, most cards in limited are not worth it. 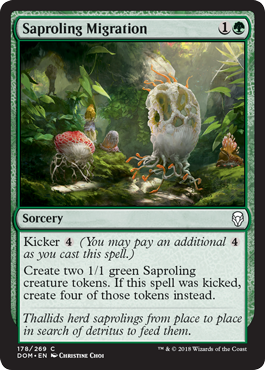 This is really similar to Skulduggery but you get a Saproling instead of +1/+1 until end of turn. 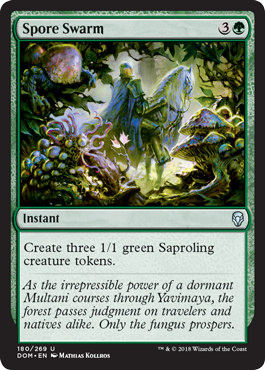 I think the Saproling is much better since it can stay permanently compared to the temporary pump effect so this card is a great trick. For the price of 10 mana, you can win the game. But if 4 mana is the best you can do, it is still a very powerful creature to play on turn 4. My thoughts on Knight of Grace carry over to Knight of Malice. 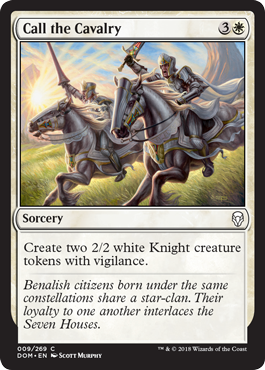 I do think Knight of Grace is slightly better though since white is the main color of Knights, but these two cards are basically twins. 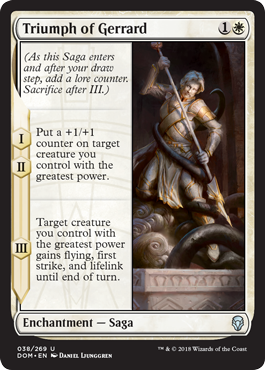 This is one of those cards that are hard to rate without playing the set so I am giving it an average grade for now. 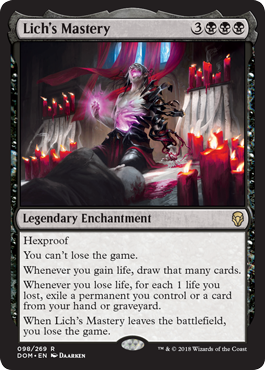 Since it has hexproof and you can’t lose the game unless it leaves the battlefield, I’m not sure how many ways your opponent has in dealing with it other than make you lose as much life as possible so you will eventually have to sacrifice Lich’s Mastery. 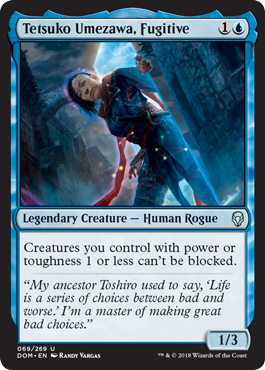 But making you lose life is a big part of strategy in limited anyway so it might be a huge liability to play this card. I am a big fan of recursive threats, especially ones that have a lot of power and toughness. Its biggest downside is costing 6 mana to cast though so I probably wouldn’t want too many of these in my deck. 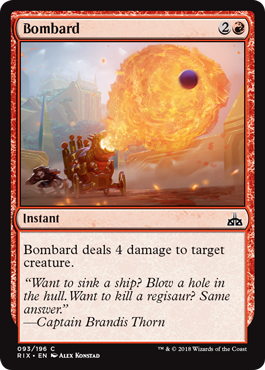 It takes a couple turns to get this Duneblast going but it’s a great way to keep your best creature around while getting rid of your opponent’s creatures. Hopefully they aren’t playing many artifact creatures and you get the board all to yourself. 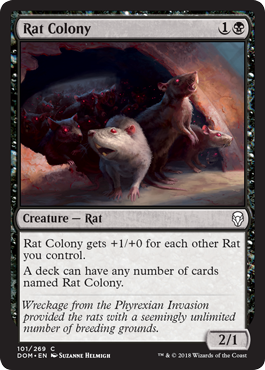 These rats grow stronger in numbers, but you can also just play one of these as a 2 drop creature. If you do manage to pick up a lot of these, it is a good combo with Tetsuko Umezawa, Fugitive. You are going to want some amount of board state before playing this, though it does grant you a couple of tokens just in case. 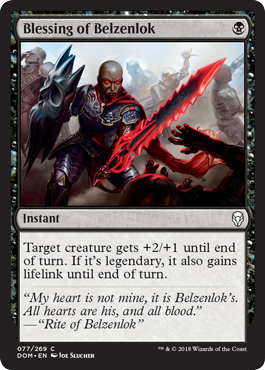 Your opponent can see this coming though so they might try to push through as much damage as they can or even get rid of your Saga before Belzenlok comes out and leave you with a couple of 0/1s. 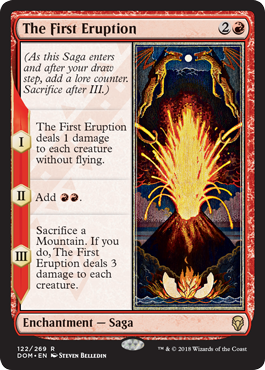 Still, it is a very powerful rare that I would be happy to have in my deck. 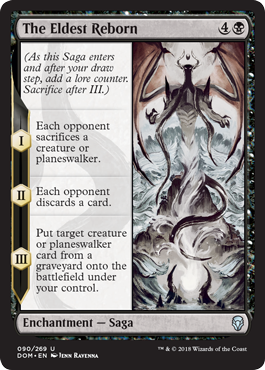 You won’t see too many Planeswalkers in limited so the second effect is almost irrelevant. But it is still a great unconditional removal spell. 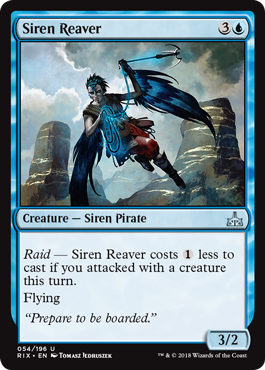 While Recover was pretty good in Rivals of Ixalan Limited, I feel like this card is slightly worse. I think drawing a card off of your deck is better than choosing another creature from your graveyard to bring back. Another card with a kicker effect that I really like. 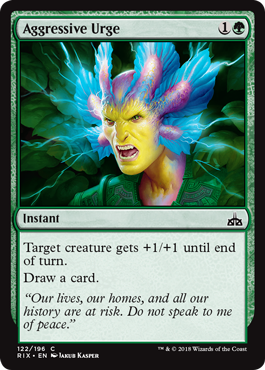 I think I almost always will want to wait until turn 4 to cast it because a 3/3 menace can be really annoying to deal with, but if you need to be aggressive, this card will be annoying on turn 1 as well. I always feel like this effect is really strong. You can attack in a lot of times and threaten to sacrifice a creature or two if it gets blocked. 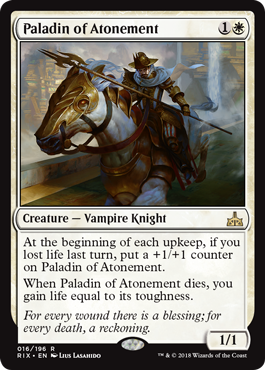 Either way, it gives you a lot of control in combat and if you don’t have anything to sacrifice, it is still an average creature. 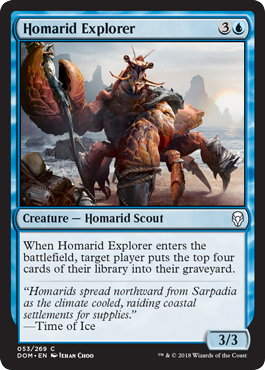 Trading expendable creatures for more cards is always a great ability. 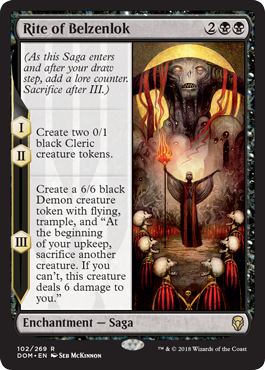 There are also plenty of tokens and some recursive creatures in this set to sacrifice as well. I like that you can choose from creatures in your opponent’s graveyard as well. It gives you more options and it’s always way more fun to beat your opponent with their own card. However, it is a little slow in getting there hopefully the creature you are bringing back is worth the wait. 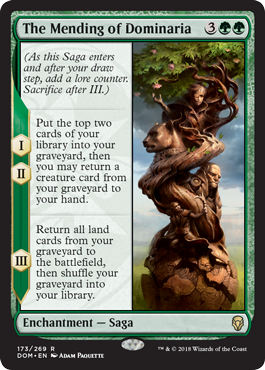 If I had 2 creatures out by turn 4, I would definitely sacrifice both of them so I could cast a 7/6 on turn 4. It seems like a big price to pay, but you also get rid of a huge chunk of their life total especially that early in the game. Either way, I think this is a good rare. 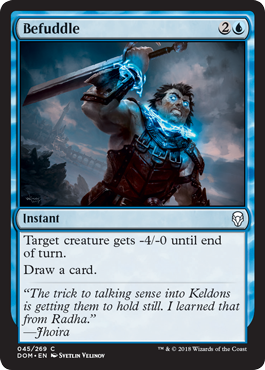 I like that this card gives you the upside of drawing a card when your opponent is out of cards. The downside with making your opponents discard all their cards is that it has diminishing returns. 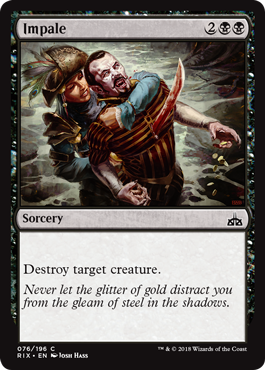 But in this case, you get to draw a card and that makes it a big threat to your opponent. This is a really good removal spell/combat trick. It is so cheap and has a great kicker effect. I would play as many of these as I can. This is best in a deck with expendable tokens, but it can also be powerful if you can turbo out a powerful rare from your graveyard. 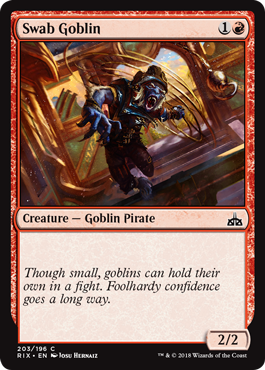 It does require the right deck and set up though to be really good, but it will usually be a threat that your opponent needs to deal with. 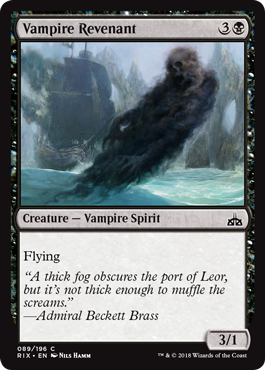 I think this is a slightly below average creature and probably would not be excited to have it in my deck. It does have synergies with other cards in the set, but unless you are looking for those types of effects specifically, I don’t see it being desirable. 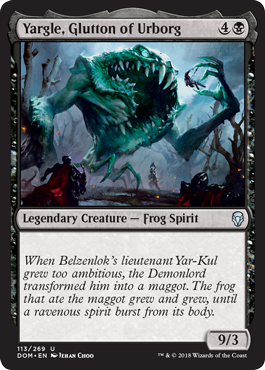 Sorry, Yargle. 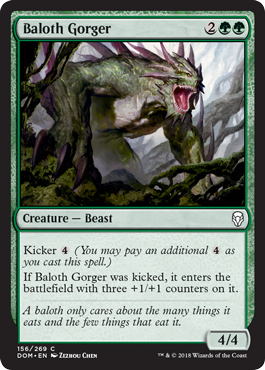 I am not a big fan of paying 5 mana for a creature with only 3 toughness and no other effects. 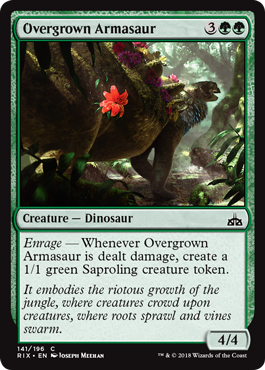 Overall I think Yargle is pretty average but I know I will be tempted to cast Yargle and give it an Arcane Flight. You get the best creature in any graveyard and destroy your opponent’s best creature for the cheap price of only 5 mana. 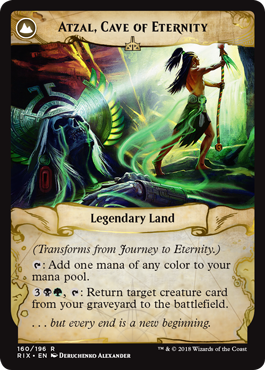 All you need to do is make sure you have a legendary creature on the field which is easy to do so that makes this a solid rare. 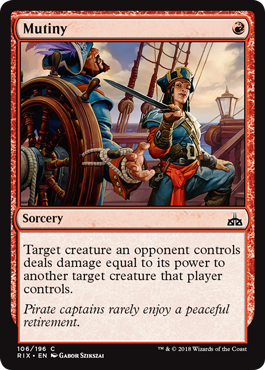 I doubt that I will be casting kicked spells every turn so I expect this card to mostly be a 2/2 for 2 which is a nice, average card. This card is probably a trap but I’m going to fall for it. 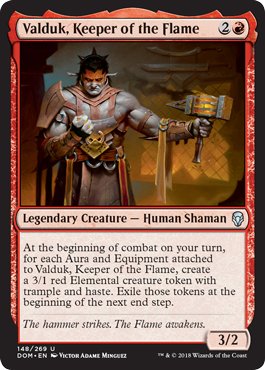 It only costs 2 mana though so you aren’t investing too much, other than building your deck around auras and equipment which is what red wants to do sometimes anyway. It’s not a terrible combat trick, but it’s not my favorite either. 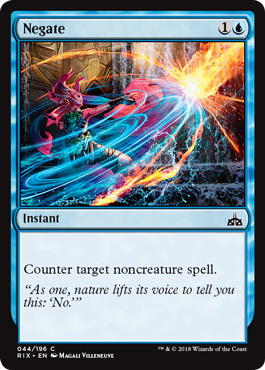 +1/+0 doesn’t give enough power to ensure your creature is an effective first striker and I don’t think you want to use a whole spell slot in your deck to give haste unless you are very aggressive. 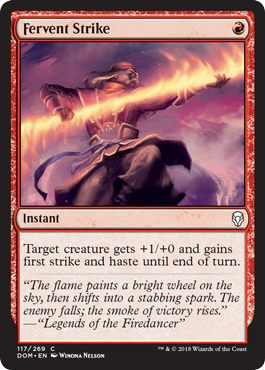 This is the kind of average removal spell that I would expect from red. It does give you an option which is nice, but it is a sorcery so you will likely have to tap out to cast it which does takes away options in a way. With that trade-off, it is about average overall. If you can pay for this kicker cost, you deserve to burn everything in sight. 3 mana to deal 5 damage is very good though, even at sorcery speed. 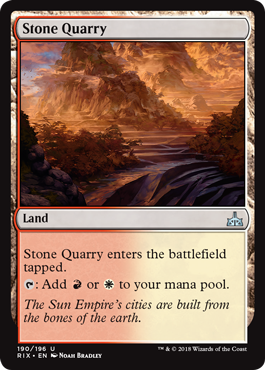 This card takes me back to M13 (the set that got me into Magic) so it is nostalgic for me. Even though it is an average creature, it brings me back to some above average memories. 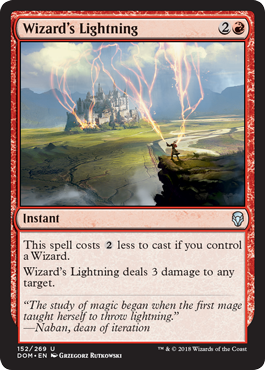 I am assuming you have some number of wizards on the field when you cast this and getting a Sand Strangler effect is really strong in limited. Even if you don’t, it is still a decent card. 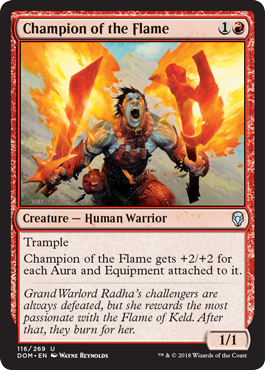 I really like this aura because it’s very cheap and you get good stats and a keyword for it. Menace can help you trade off 2 cards for 2 cards better as well so you don’t have to deal with the biggest downside of auras. 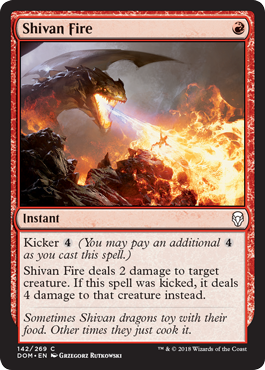 This card has another kicker effect that I like. 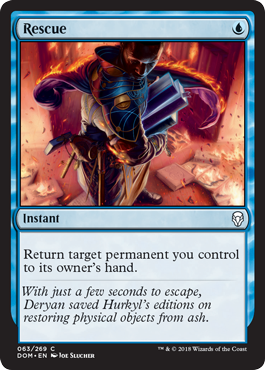 Being able to get back a removal spell is huge in limited where sometimes there aren’t many to go around. A nice average wizard for any wizard deck, and a nice average creature for most decks. I usually don’t really like cards like these but I think this one is about average. 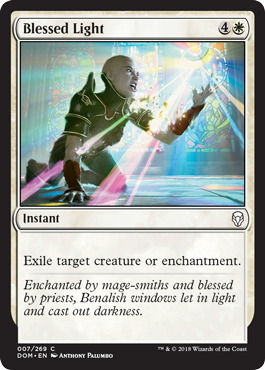 Even if you aren’t in a dedicated wizard deck, there will probably be instants and sorceries in your graveyard at some point to be able to cast a 1 drop 2/2. 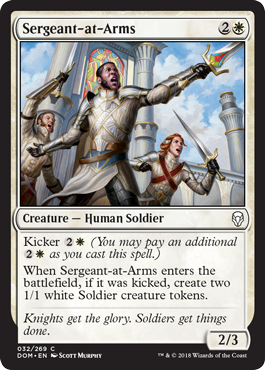 Maybe I am overrating this card, but I really like that it has that extra kicker option. An extra 4 damage is one fifth of the starting life total which can amount to a lot. 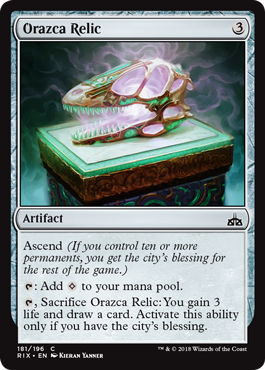 This card can definitely clean up some board states and it is just really powerful on its own as well. 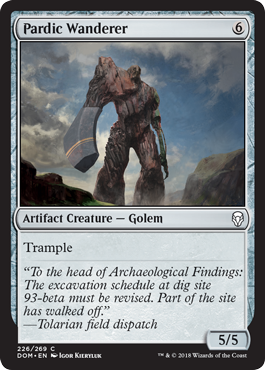 I also think it will be a good constructed playable card. 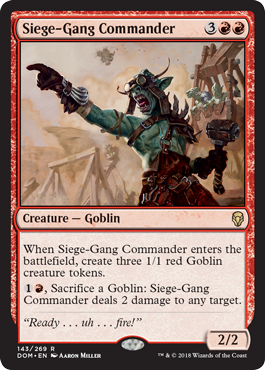 All these goblin cards make me really excited because goblins are my favorite tribe. 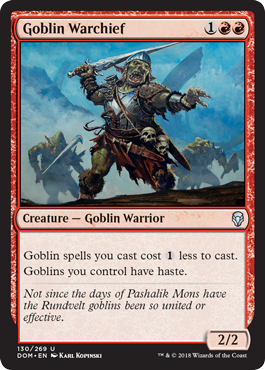 Unfortunately, most goblins are rares in this set so it will be tough to assemble a goblin deck. This card is still pretty decent on its own though. This will get rid of some of your opponent’s permanents that are in your way, but it does cost a lot of mana for a random effect. 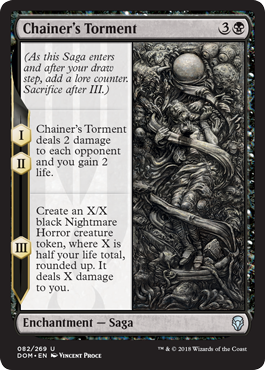 Your opponent will get to keep one of the four permanents as well and it might be the one that you wanted to get rid of the most. I think an average grade for this card is about right since I wouldn’t pick it highly in draft but I might play it if I had it in a sealed pool. 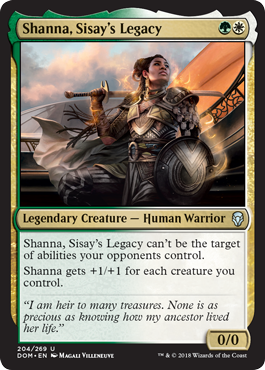 Planeswalkers are already tough to deal with in limited so one that enters the battlefield at effectively 6 loyalty counters is going to be a huge threat. 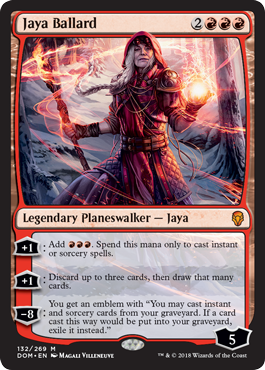 Jaya doesn’t necessarily protect herself well though so there’s a chance that Jaya doesn’t swing the game too much, but she still gives a huge advantage once in play. You don’t even need to split up how much X costs for this spell. You can just hit 3 targets for the exact same amount that you paid for and that can easily wipe some limited boards for maybe about 5 or 6 mana total. 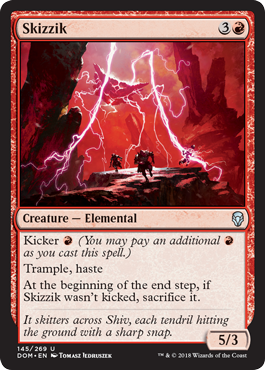 While it has a decent kicker effect, it is a situational effect so I don’t think it deserves the bump that I give some of the kicker cards. 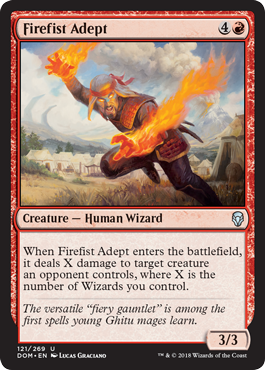 This is a solid common and it gives red the ability to draw a card which rarely ever happens. Definitely makes it slightly above average for me. This is your average 2 drop 2/2 with upside. The upside on this card is actually pretty cool though so I am tempted to bump it up a little bit. But I think most of the time, it will serve its 2 drop 2/2 purpose. 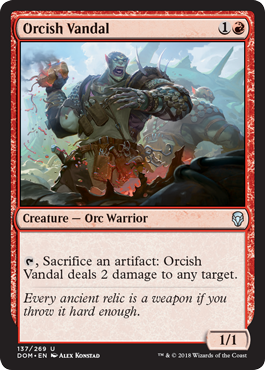 I think as long as you have an artifact on the field, this can be an annoying card for your opponent since it can hit any target. 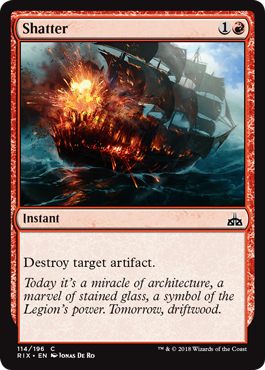 Unfortunately, I don’t really think trading artifacts for 2 damage will be effective all the time so I don’t think this card is particularly powerful, just about average. The key to this card is that it is a wizard, but it’s definitely a below average one. Haste can take some opponents by surprise though. This isn’t a great removal spell but it is a decent burn spell. 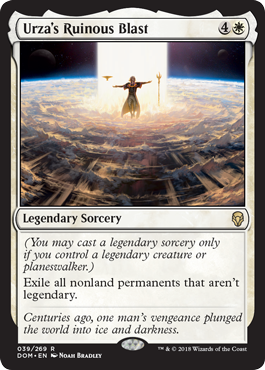 I can see it mostly being a sideboard card but I wouldn’t fault someone for having it mainboard sometimes either if they needed the reach. A 4/4 for 4 mana sounds great until you realize that it really only attacks as a 2/4. This card can be strong if your opponent’s board state is weak, but that’s true about a lot of cards. Overall I think it is about average. 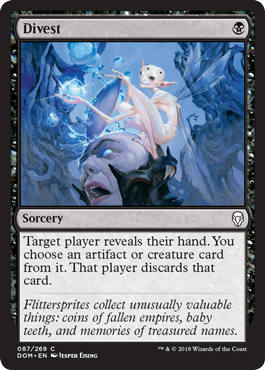 I would bump this card up to average if it didn’t require your creature to be attacking but since it does, I think that makes it a little bit weaker since I think it makes easier for your opponent to guess what trick you have in your hand. It can be a good way to push through the last few points of damage though. 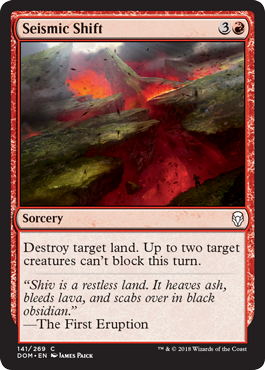 No one really likes these “destroy target land” cards but this one also makes two creatures unable to block so you can for damage through. 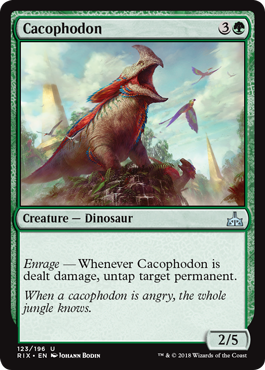 I wouldn’t really want to play a card like this though unless I absolutely needed a way to push through some creatures to win which shouldn’t be the case most of the time. This is basically shock but with more upside. You can shock if you need to early or you can deal with something bigger later. This is probably the best red common. 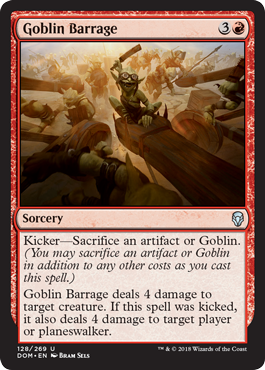 This is a solid rare to open and getting to upgrade your 1/1 goblins into 2 damage to any target means you can get a lot of value from this card. 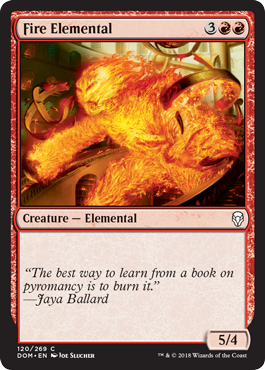 This card is okay, slightly above Fire Elemental in my opinion so I will bump it up slightly in the grading scale. You can catch your opponent off guard with it and that’s about the best scenario. 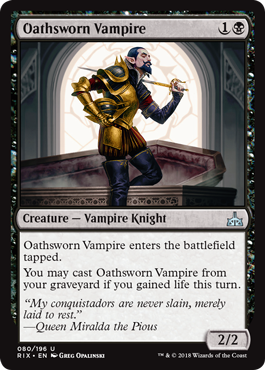 So when this card was first spoiled, a lot of people linked me to the new Squee. 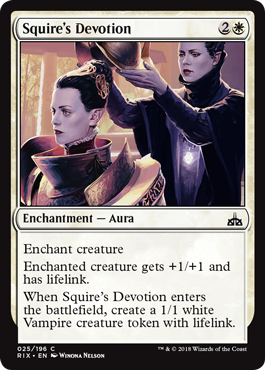 When I read the card, I compared it to the previous Squee in my head and I felt like the previous Squee was a little more versatile so I thought this new Squee wasn’t that great. But after reviewing the rest of the cards in the set, I think he is probably one of the best rares, especially in limited. 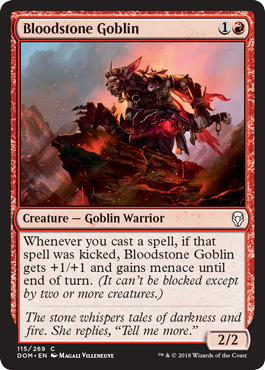 He can chump block indefinitely, he is Legendary so he triggers all the cards that say “when you cast a legendary”, he is also an expendable creature for all those “sacrifice a creature” costs. 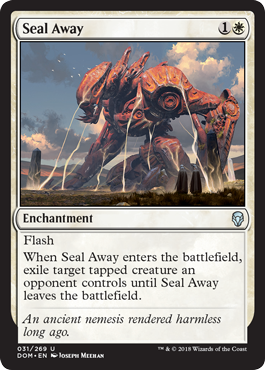 I think Seal Away is probably the only way to get rid of Squee in this set but you can easily fade that by not attacking with him. He also easily wins the cutest card in this set. 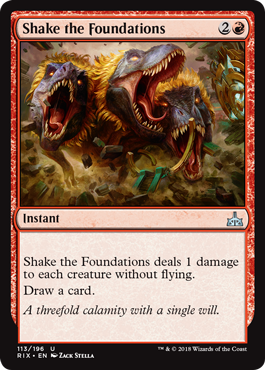 The weird thing about this card is that your opponent will see the board wipe coming and will probably stop casting more creatures until the “eruption” happens. 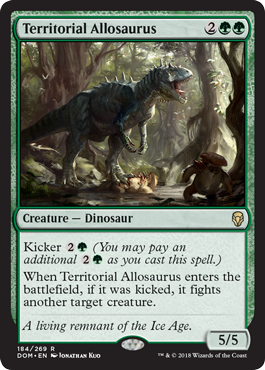 They will likely also start aggressively attacking with their creatures since they are going to die anyway. Either way, it is usually nice to have a card that wipes the board in limited. This isn’t my favorite Saga since the first thing it asks of you is to discard your hand. You definitely don’t want to play this out on turn 2. 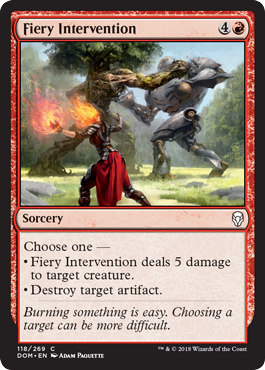 The last effect is also conditional of you setting up a strong board and/or having good red sources of damage in your hand. This is a funny card and when I first read it, I thought you flipped the coins before it attacks. Having to flip it mid-combat makes it worse. Hopefully you can access whether it will be safe to attack no matter what the outcome is. 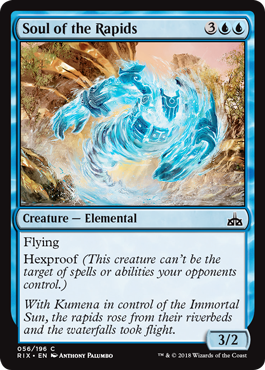 Even if you just put one aura or equipment on this guy, you get a 3/1 elemental attacking every turn. That isn’t the easiest thing to deal with in limited and if you get more auras and equipment on him, he will be a huge threat. I would almost always wait to cast this for 7 mana and get 2 4/4 Dragons on the field. I know that isn’t always possible though and that is why it is very nice that this card is so flexible. 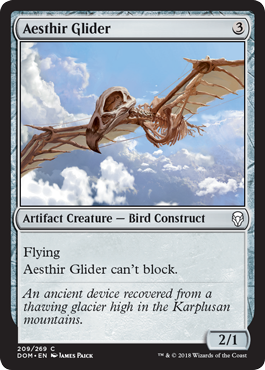 A 4/4 flying for 4 mana is nothing to be sad about. 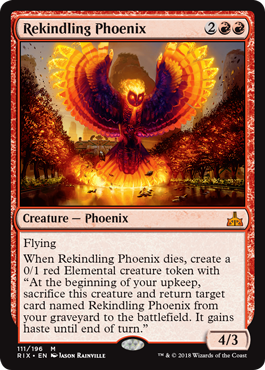 You won’t always be able to get back this phoenix since attacking with 3 or more creatures isn’t always easy to pull off in limited, but I do like recursive threats. 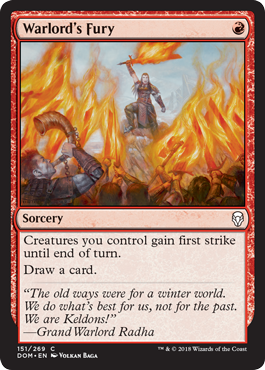 This is not a good card… giving your creatures first strike won’t be game ending and even though you get to draw a card, I don’t think it is worth it. 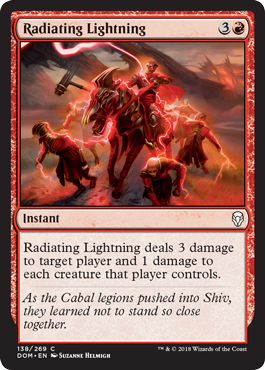 Lightning bolt is great and even if you have to pay full price, it is still a great card. Since limited decks are mostly creatures and lands, you most likely won’t miss, but looking at only the top 3 cards isn’t very deep. You’re not really digging at that point, you’re just happy with whatever turns up. Which is why I think this card is below average overall. I think this is below average compared to your normal fight spells because it is much more conditional. 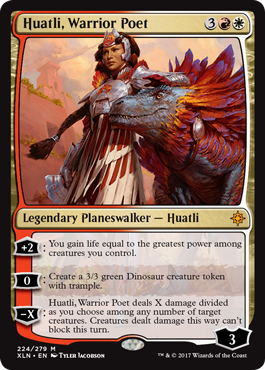 I don’t think it will be tough to get a legendary creature out on the field, but you do need one so that lowers the grade for me a bit. 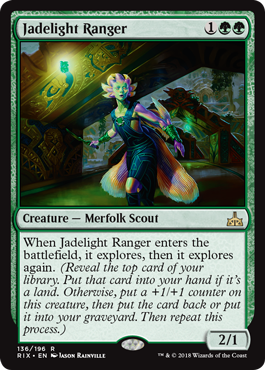 I wanted to give this a sideboard grade but since the counter stays on the creature, it is probably slightly playable outside of the board. Not by much though. I don’t think you want this as a combat trick but it’s not the worst. 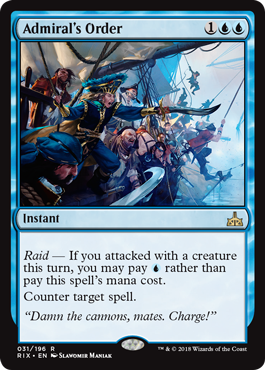 This has a great kicker for the late game and it’s also good on turn 4. Green has such big creatures compared to the other colors and this one is no exception. 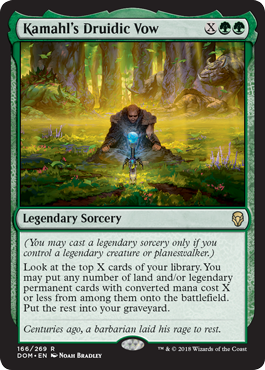 I bumped this up a bit higher than just a sideboard grade because there will be enchantments and artifacts in almost every deck so I think it can be okay to mainboard in sealed but I most likely will leave it in the sideboard. This is another card that is mostly a 2 drop 2/2 but it does have some fun upside. If your opponent is playing equipment, it can randomly be annoying for them to attack through. Anytime you get to ramp into spells faster than your opponent, you will have a big advantage. 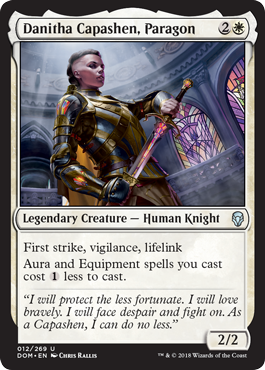 I can see this card being picked highly in draft. This is an interesting card. 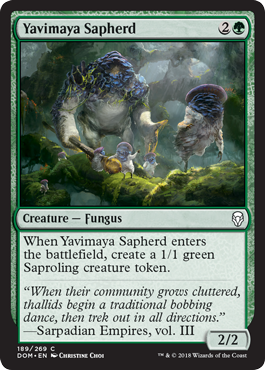 It can be a good mana sink once you have some creatures in your yard but I think for it to be really effective, you would want some of those cards that want expendable creatures. This card seems very specific to me. 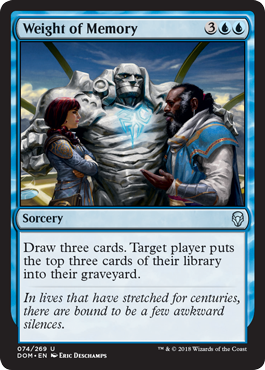 I’m not exactly sure when you would want this except maybe against an opponent that is playing a lot of recursion? I don’t expect this card to see play very much though. 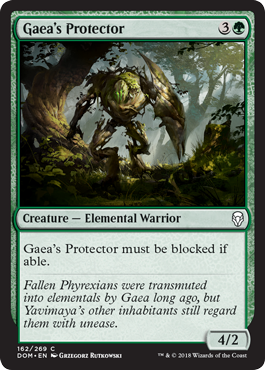 Gaea’s Protector must be blocked and will be easily blocked by a 2 mana 2/2. 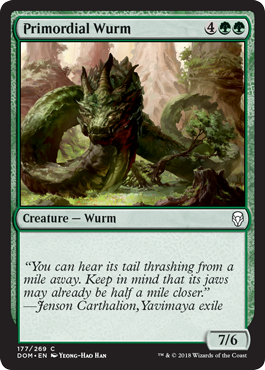 I think this card is definitely below average and maybe would be best left back to block bigger creatures. This is a very powerful trick and I will definitely get ambushed many times in this format. It’s cheap and you will catch your opponent off guard most of the time. This is your average turn 3 ramp spell. You likely don’t want too many of these, but the first one is usually worth it to play. It also makes splashing different colors very easy. I feel as if the kicker effect is almost excessive on this card. 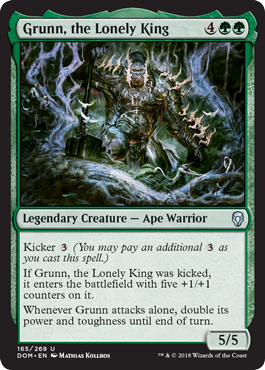 Grunn already attacks alone as a 10/10 so I don’t see how paying 9 mana to attack as a 20/20 is going to make much of a difference. It is just a huge threat either way. I can see this being a powerful card in a deck playing a lot of ramp and a lot of random legendary permanents. 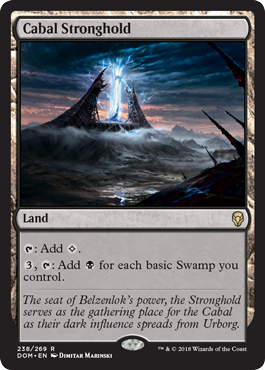 This would probably be easier to pull off in sealed than in draft since it is a slower format. I don’t think see it being a good first pick in draft though but it’s an okay card that can be powerful in the right deck. 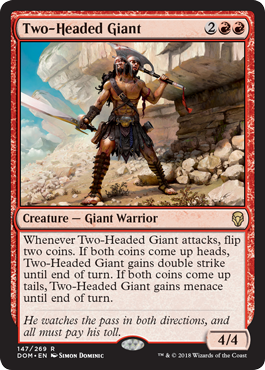 I think this card is about average and I have a funny mental image of someone tapping out 8 mana and their opponent being worried about some giant creature when it turns out to be just a 2/3. 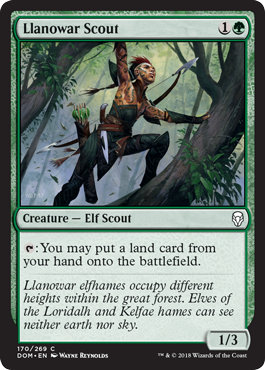 I am very happy Llanowar Elves is back in our lives. 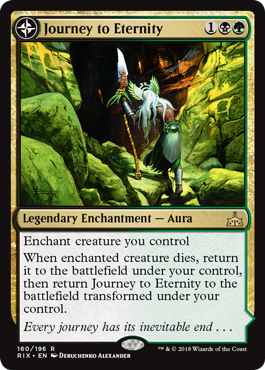 It can give green some really insane starts in limited but I think green has been kind of weak in limited in the past few years without it. 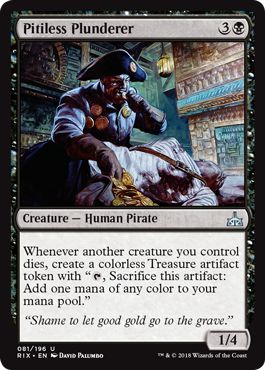 I think this card is mostly just an average creature although it can help you fix your mana for a price. 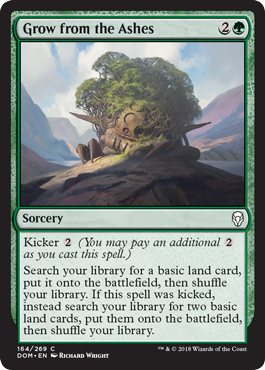 This card can potentially help you ramp but only if you are holding lands in your hand, which hopefully you don’t have too many as you also want spells for you to ramp into. 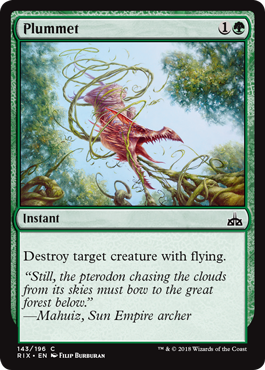 Besides having extremely terrifying art, it is mostly an average creature that will help green block those annoying fliers. 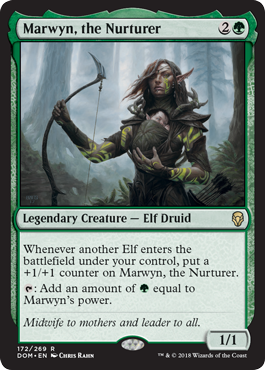 There aren’t a lot of elves in this set but I think you will find a couple to grow Marwyn a little bit. 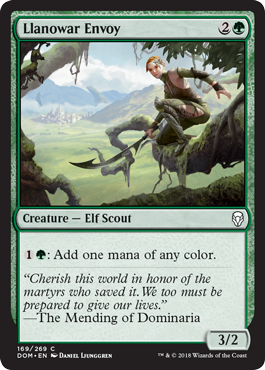 Even just playing one more elf after her will make her a good mana source. 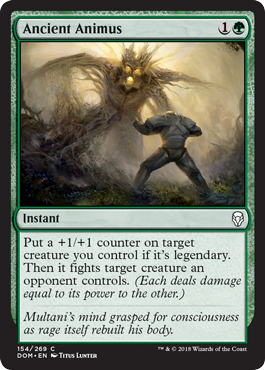 I almost want to give this a 5.0 but I suppose Multani can’t really single-handedly save you from losing or anything. 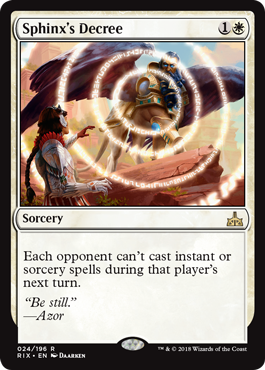 It is still such a powerful card though and I don’t expect many people who cast it to lose. 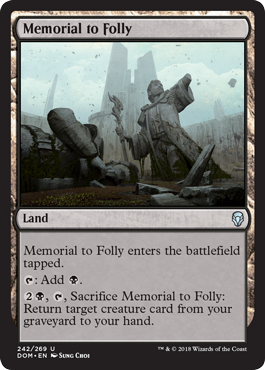 I don’t really like cards like these because it usually means that your creature has to have died in the first place. 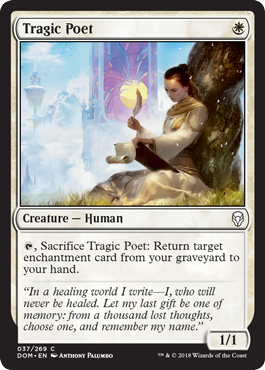 But since it lets you return a permanent and not just a creature, I suppose it is slightly better since you can return Sagas that usually hit the graveyard when you have gotten max value from them. 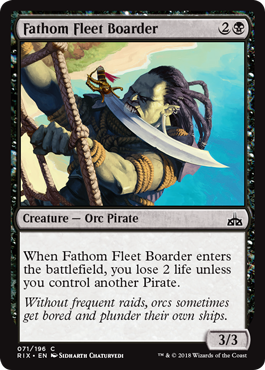 I think I can safely say that this is a sideboard card. 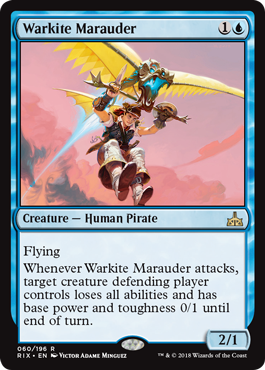 I wouldn’t put this in my deck blindly hoping that my opponents will be playing fliers in their deck. This card is big but that’s about the most that it has going for it. 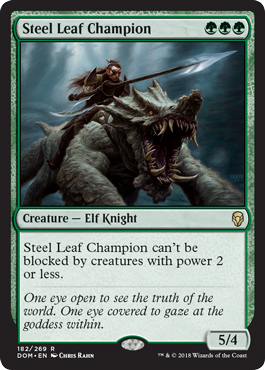 Your opponent will have to respect it though and maybe have to trade off a couple of creatures to it. 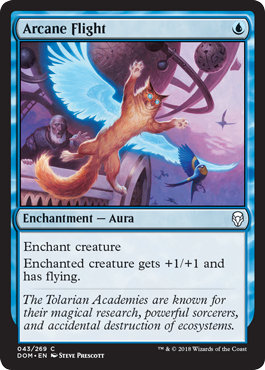 Not only do I think this card is good, it is also kind of adorable. 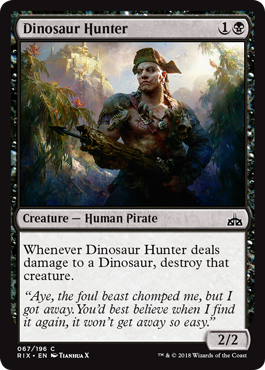 If you were looking for expendable creatures, this card is perfect. This card can really help you ramp and build your board over a couple turns and then on the final turn, all your creatures can really do a lot of damage if your opponent is not prepared. Surprise saprolings are definitely going to ambush me in this format, I guarantee it. 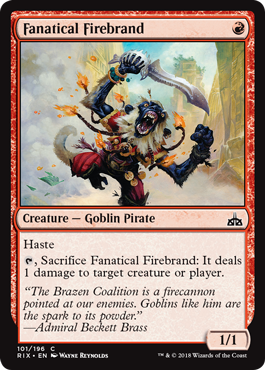 This card is great though and it makes the expendable creatures strategy even better. 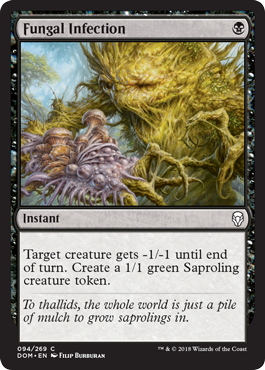 I know everyone is excited for wizard tribal in this set, but I think I’m mostly excited for saproling tribal. It is definitely not as deep, but giving +1/+1 to a bunch of little tokens really add up to a lot of power. 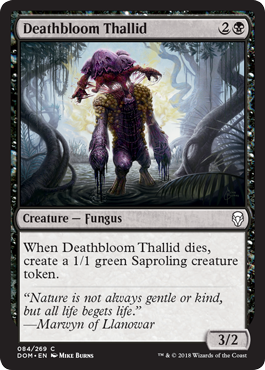 One thing saprolings can’t deal with though is this card. 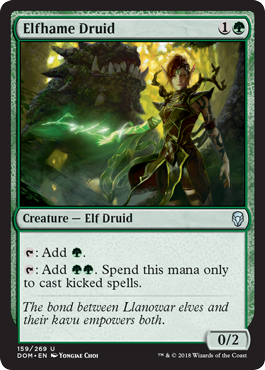 This can even potentially be played on turn 2 if you start with Llanowar Elves on turn 1. 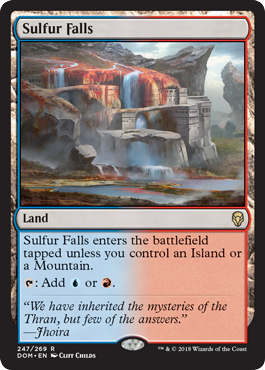 If you can avoid tapping your lands for mana to cast this card, then you should have plenty of lands coming into the fight for you. 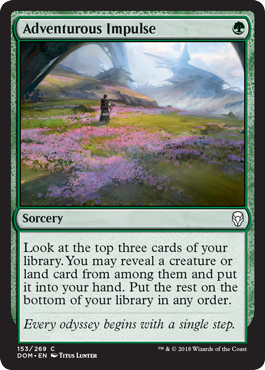 They are only 2/2s though so I would make sure to have a lot of lands and other creatures on the field too before I go for a game-ending attack. 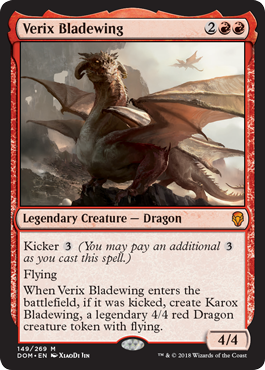 I would definitely wait to cast this card with kicker if I can. 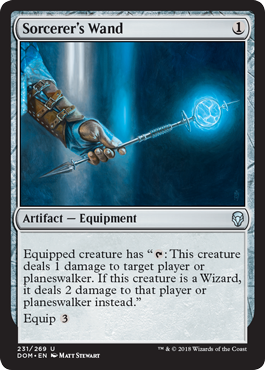 It doubles as a removal spell and it’s such a huge advantage to kill their creature and get a 5/5 on the board. 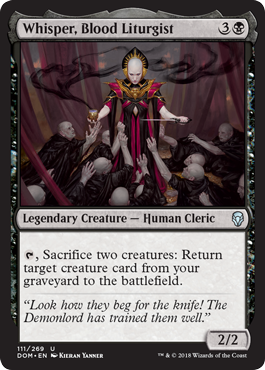 This isn’t a great rare to open in my opinion, and while you are getting a couple of creatures back from the graveyard, I just feel like there are better things you can be doing for 5 mana. 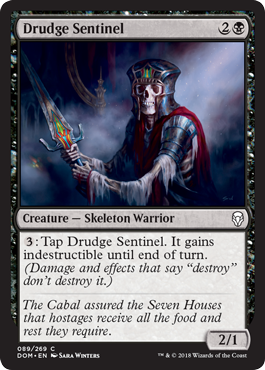 A 7/7 for 7 mana is about average but if you can guarantee that your opponent takes 7 damage (if you don’t want to kill any of their blockers), it makes it slightly better than average. 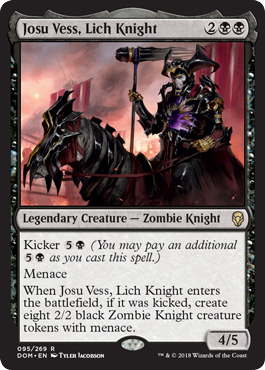 I feel like I always say that I like a card a lot if it has a kicker that I approve of but I really do like this card a lot. 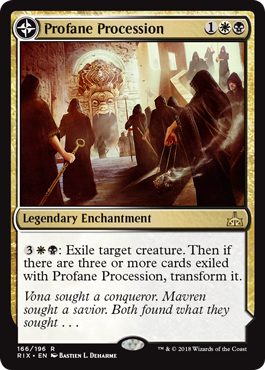 Vigilance and trample makes it a solid uncommon. 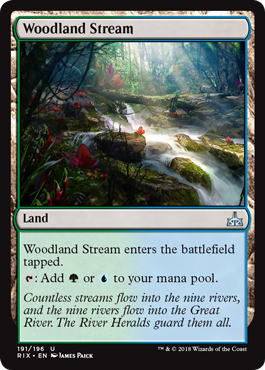 8 mana is a lot of pay but you do get a very big threat and since green has a lot of ramp spells, I think 8 mana isn’t as ridiculous of a cost as it would be in other colors. 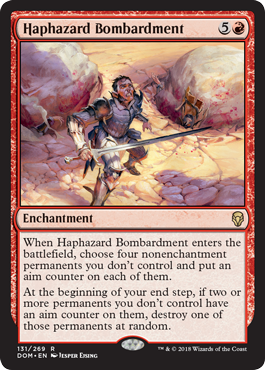 This can definitely be a blow-out in combat, but you can also just give your team an overrun effect as well. You will need some amount of creatures on the board for this to be effective though. 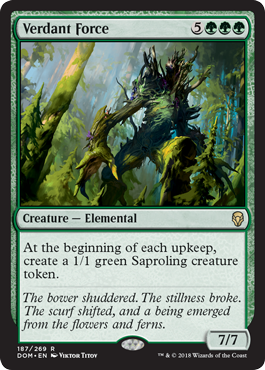 This is a solid common creature especially for the deck archetypes that Saprolings and Fungus want to be in. 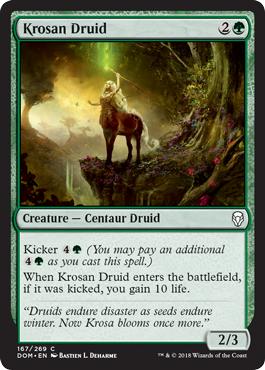 It’s still just a solid creature in any green deck as well. 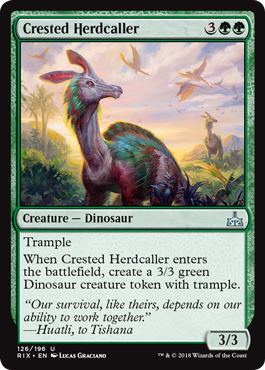 Most of these multicolor creatures are going to be solid uncommons and this one is no different. 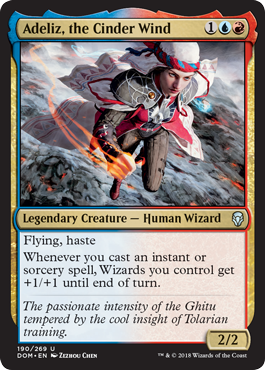 If I saw this go around the table, I would take it as a huge signal that wizards is open and I would do my best to draft the wizard deck. 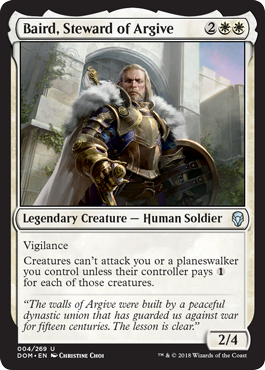 I think Arvad would be easier to play in sealed than in draft since you know how many legendary creatures you have right off the bat, but he would still be a strong card in any deck. 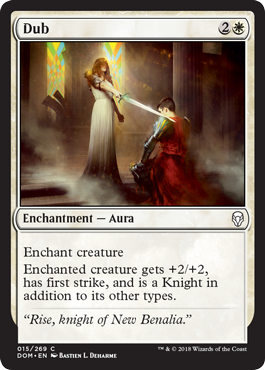 This is the biggest payoff for drafting Knight tribal. 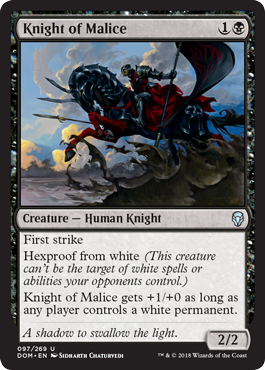 Even if you aren’t in Knight tribal, this card is just a huge threat on its own. 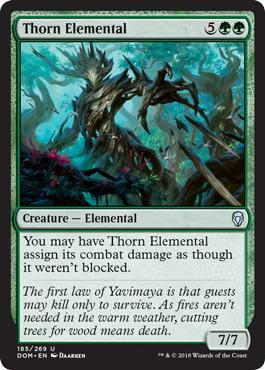 I suspect this will fit best in a green deck that can ramp into this card maybe as early as turn 5. It is very hard to deal with outside of exiling effects or countering it. Once it is on the battlefield though, it will likely demand very specific cards from your opponent or else you will easily win the game. 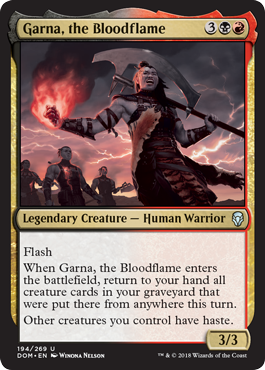 Even if you don’t want to play Garna to return creatures back from the graveyard to your hand, she’s still a solid creature to flash in end of turn. 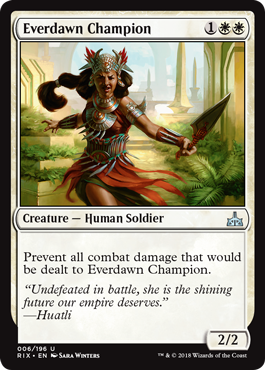 You can also get a lot of value from her if your opponent ever tries to wrath your board. 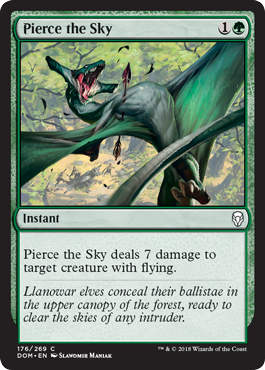 It’s an interesting effect to use creatures to attack to ramp. 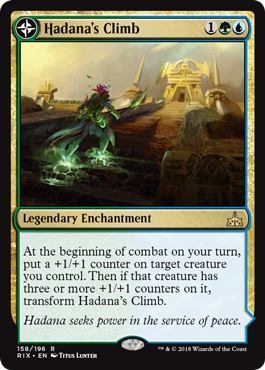 I think Radha is a decent rare but if you don’t have creatures to attack with or anything to ramp into, she might fall a little short of the strong rare you were hoping for. 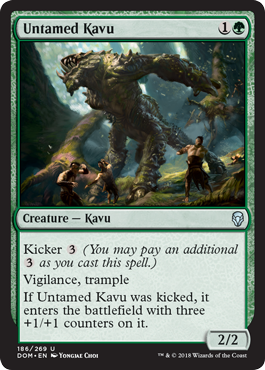 Even as just a 3/3 for 3 with trample, this is a solid card, but it actually has a really good ability. 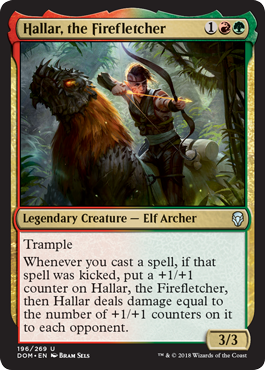 There are lots of cards that add +1/+1 counters so you don’t necessarily need to kick a lot of spells for Hallar to do a lot of damage. 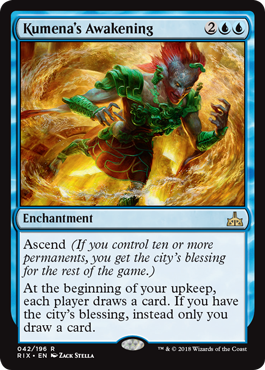 If you are playing blue/red, I think you would mostly want to be in the wizards deck. 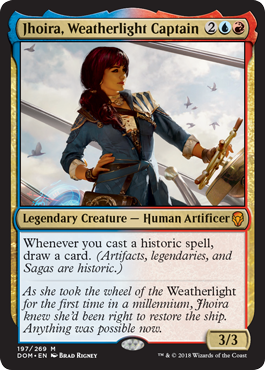 I think blue/red has an artifact subtheme though and I think that’s where Jhoira would be most effective. Either way she is a strong card but maybe not at the mythic power level you were hoping for. 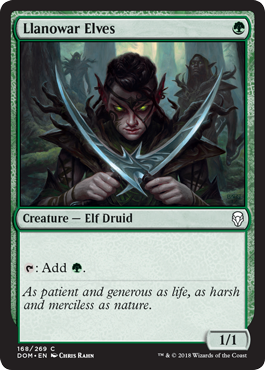 This is such a strange card and it isn’t in green unfortunately so it might be a bit tougher to cast. I think ideally you would be in 5 colors if you want to use its ability as well. 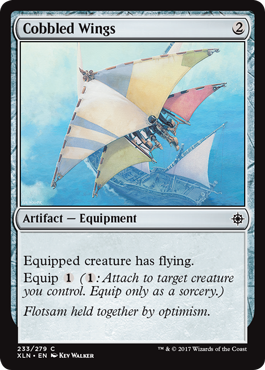 Either way, it is a 4/3 flying for 4 so if you do manage to cast it, it’s still pretty good even without its ability. This has a pretty insane ability and I think it might be one of the strongest cards in this set. 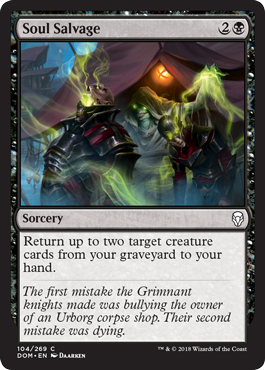 You get to use your graveyard as part of the cards in your hand and that almost never happens in limited. 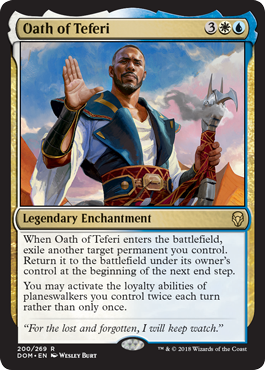 Even if I do have Planeswalkers in my limited deck, I might not even want to play Oath of Teferi. 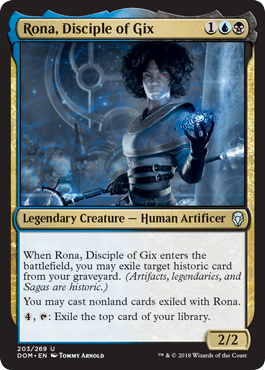 It does reset your Planeswalkers though which is kind of great, but Planeswalkers are almost non-existent in limited so I wouldn’t worry too much about this card. 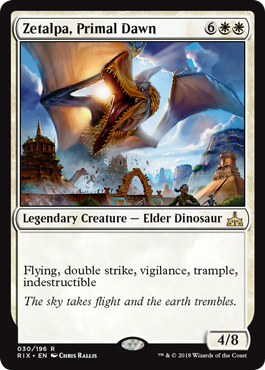 This will be really strong in the Legendary creatures deck but you do need to control one Legendary creature before you can cast this. The strength of this card will depend on how many Legendary creatures you have in your graveyard. 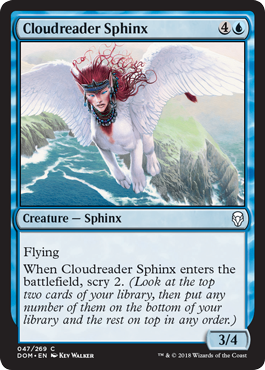 This is a great card in the blue/white flying deck and also just a tricky card in general. Some Sagas would be very hard to play around if they came in at instant speed. I like cards that enable their own abilities and this is one of those cards. 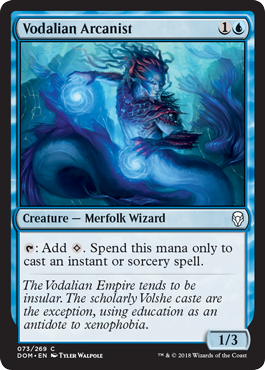 I am not sure how strong blue/black will be though but it’s possible to splash this card and still enable its ability. 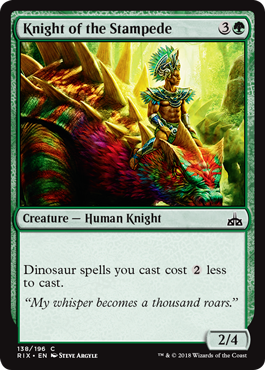 Since green/white has a lot of tokens, I expect this card to be very powerful. At only 2 mana, you really only need one other creature for it to be cost effective and if you have more, then it’s even better. 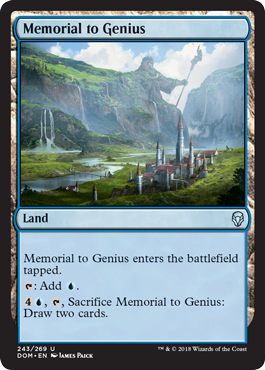 This is a great mana sink and can give you even more value when you are sacrificing your saprolings to other effects. It even provides saprolings for these effects so it just has about everything you are looking for. In my mind, when you play this, you are pretty much drawing an extra card every turn which is very powerful. 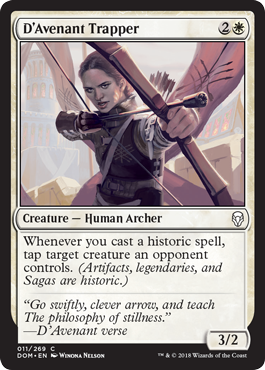 It doesn’t really go into any specific archetype though but it is a good card on its own. 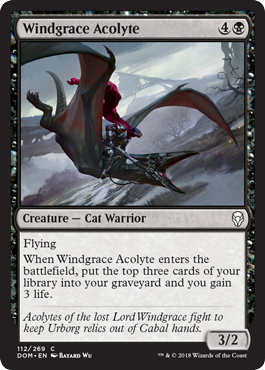 Getting to draw an extra card each turn is always great, and now you also get a Planeswalker on the field. 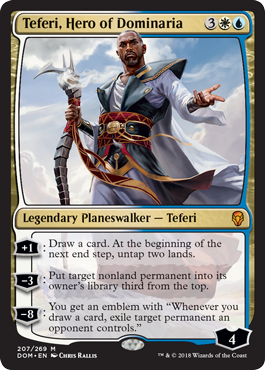 Teferi isn’t the best at defending himself but if you can protect him long enough to get to the ultimate, you basically win the game. 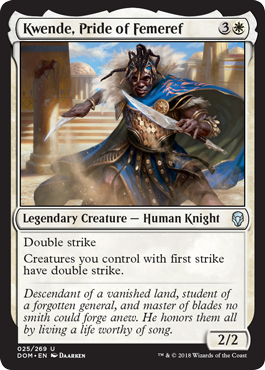 Even if Teferi doesn’t reach ultimate, I would gladly just draw extra cards as often as I can. 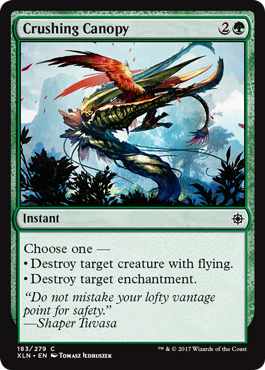 This card already had me at flying and first strike, but it does have an interesting ability. Red/white has an aura and equipment theme and this really helps you regain the auras in case your enchanted creature dies which makes up for the big downside in playing auras. 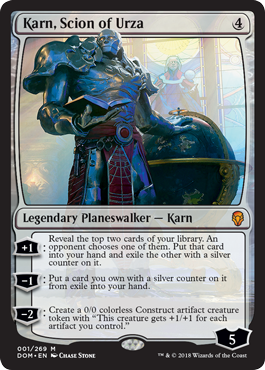 Karn has my vote for best card in the set. 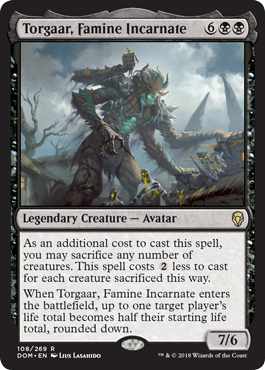 A Planeswalker with 6 loyalty on turn 4 is going to be almost impossible to deal with. You also get so much card advantage over your opponent and while it won’t win the game very fast, you will be very well set up to win even if Karn dies. This is an okay flier but it is kind of below average since it can’t block. 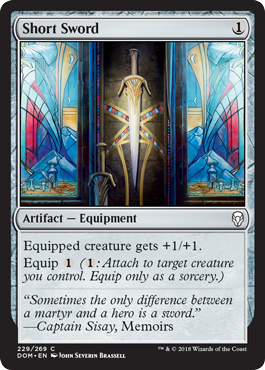 Hopefully you have a good reason for playing artifacts in your deck to put this card to a different use when it can’t really attack through in the air anymore. 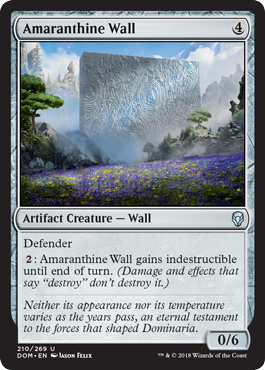 This wall will buy you a lot of time against big creatures, but it won’t protect you from everything. 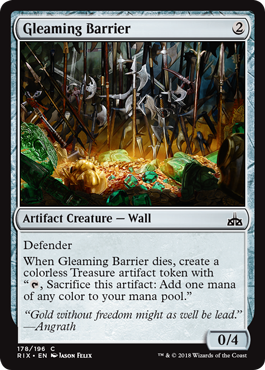 The good part though is that the wall can gain indestructible so it won’t die to deathtouch creatures. 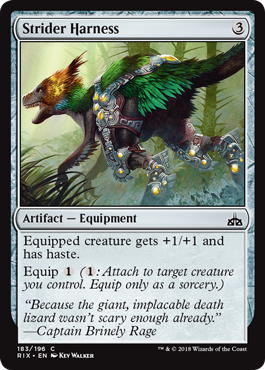 Even though it costs 7 mana to equip to a regular creature, it just means that the creature will probably be getting +7/+7 which is pretty sweet. 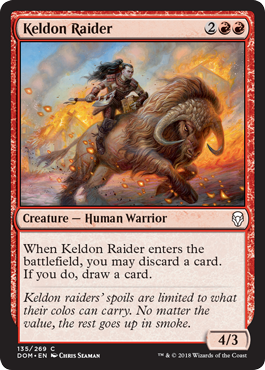 Otherwise, this is a huge threat as soon as you have a Legendary creature to pair with it. If you are really desperate for removal, this candle has your back. It is extremely slow and it’s not really that great, but it will remove most creatures for you. 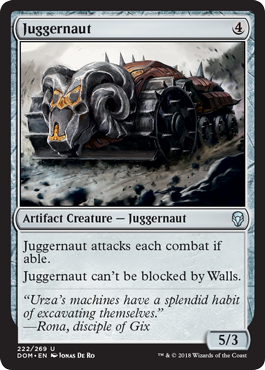 This is definitely more of a constructed card than a limited card. 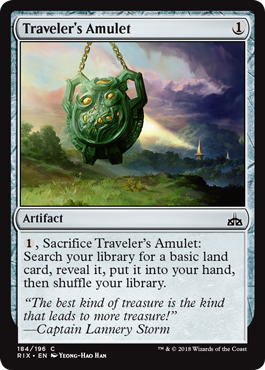 I don’t think you would want to play this unless you really needed artifacts for some reason but there are better artifacts to play. 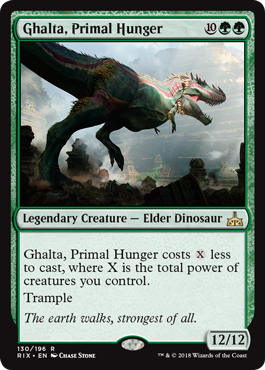 If you have expendable creatures, this would be a great card. 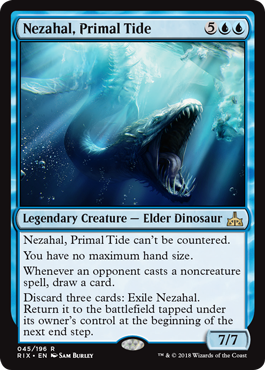 It is also just good in any limited deck though but the more creatures you have, the better. 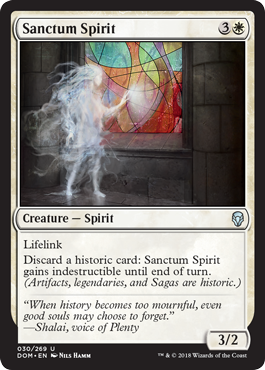 This would be a pretty good rare to have in sealed and I think it might be strong in draft too. 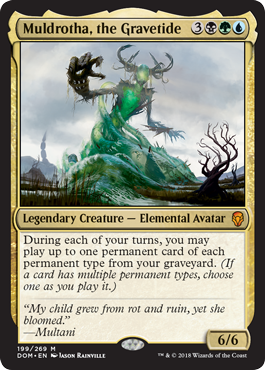 I’m not sure if I would first pick this in draft, but it is possible it is the right pick since it is colorless. This is mostly an average card in my mind even though it does have a small upside. 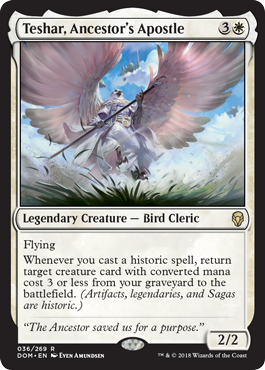 This is a strange card when it comes to legendary creatures but it is very powerful either way especially if the creature has “enter the battlefield” effects. This card is interesting because both players drawing cards whenever it attacks or blocks might make it so your opponent might not necessarily want to kill it. You’ll have to use your best judgement to see if drawing cards will benefit you more than your opponent. 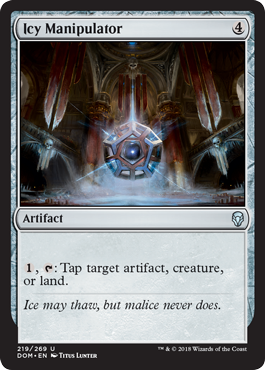 Icy Manipulator has always been such an annoying card to play against. Expect your biggest threat to always be tapped down and if they start using it to go on the offensive, then you are in trouble. 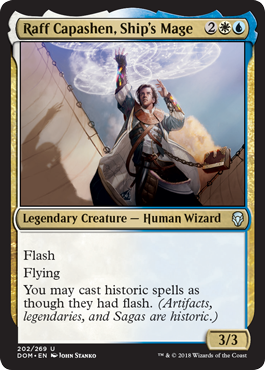 Historic spells are usually pretty expensive so costing 1 less to cast is a big upside. It’s also just a decent flier in the air as well. This equipment is a little below average for me since it doesn’t grant first strike on all turns. It is playable, but it’s not at the power level that I expect average equipment to be at. The classic Juggernaut. 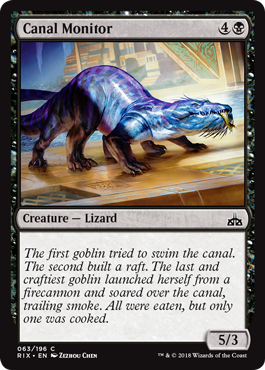 You just cast this and hopefully run over at least one of your opponent’s creatures. 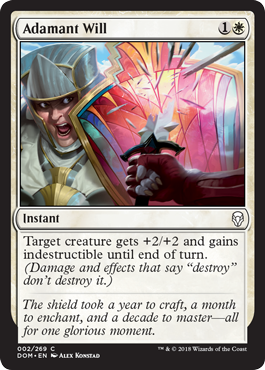 You definitely don’t want to cast this when your opponent has a 6/6 out or something though, since the Juggernaut doesn’t have any brakes once you put it onto the battlefield. 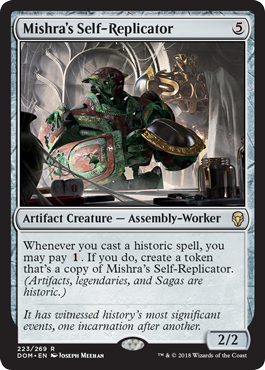 You can make an army of 2/2 Assembly-workers pretty fast if you have a couple of historic spells to cast after playing this for 5. It can be annoying for your opponent to get rid of as well. They have to get rid of every single of them before the ability goes away since all the tokens have the ability to copy themselves too. I think I would always play this in limited. 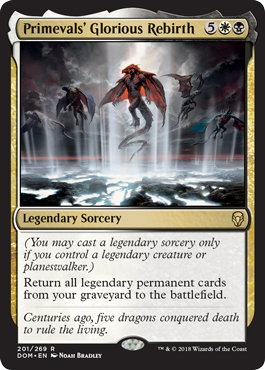 It doesn’t tap for mana until you have a legendary creature but that isn’t tough to get in this set and it is also a historic spell that you can cast for free. This is an interesting way to fix your mana, but it works and it is in the form of a historic spell on top of that. 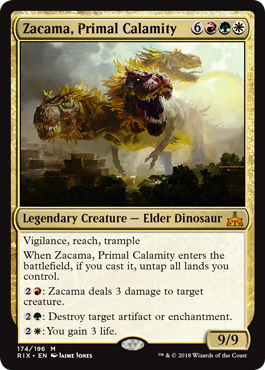 This card is quite average but it is a relatively big trample creature and a historic spell if you are looking for those things. I don’t know if I would even play 1 of these cards let alone multiple copies. I can see someone playing 2 copies at most and that is about reasonable but I feel like any more than that is overkill. 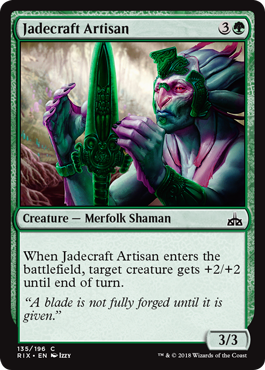 While this looks like it basically gives the creature an extra +2 toughness, but it is much better than that. It helps prevent 2 against multiple blockers or multiple damage spells so sometimes it’s even more than just +2 toughness. This is a cheap historic spell and a cheap equipment. You kind of get what you pay for with this card. 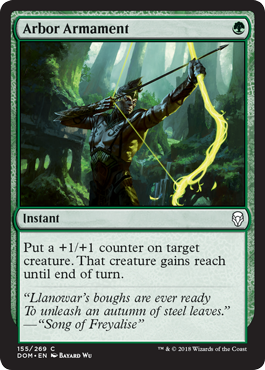 Colorless mana fixing is always good to have especially if you aren’t in green. And this happens to also be a historic spell. 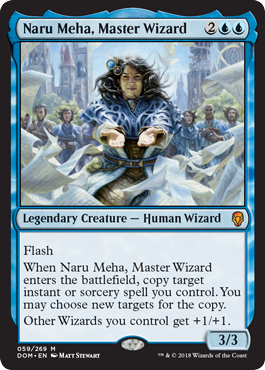 If I had this card, I would try to pick up as many wizards as I could. Even on non-wizard creatures, it is a very annoying card to play against. 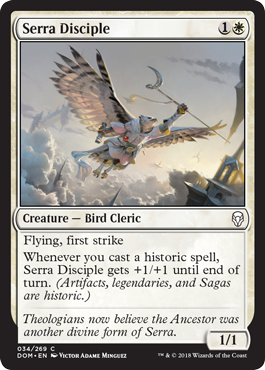 I really don’t like this card but it isn’t unplayable… It is a historic spell and it does upgrade another creature when it dies but overall, I’m not impressed. Well this card is potentially very dangerous to play against. 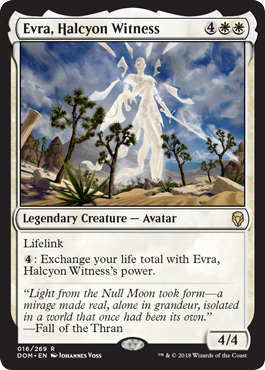 There are a lot of powerful Legendary creatures that can be cheat out for only 4 mana. They can also cast it at instant speed which is an additional headache when it comes to playing against this card. It probably isn’t too hard to get Traxos to untap, but it is additional work to do so. 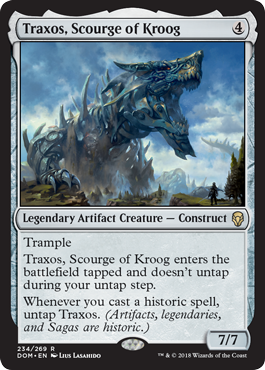 However if you have a lot of historic spells, Traxos can easily be the best card in your deck. I don’t like that it comes into play tapped though so it might be kind of useless the turn it comes into play. It is a little slow, but you get a draw a card for 3 mana. It might be more suited for sealed than draft, but I can see it being played in draft as well. Traxos would love to employ this servant. If Traxos isn’t around though, this servant will still do its job of being an average creature. 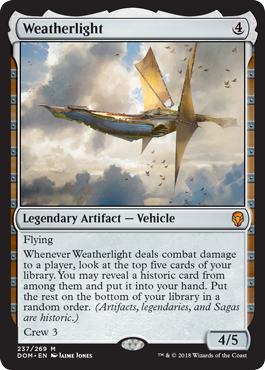 The only vehicle in the set is also a very powerful one. 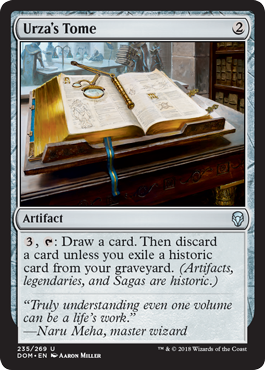 It already has really good stats and helping you dig into more historic spells is great upside. 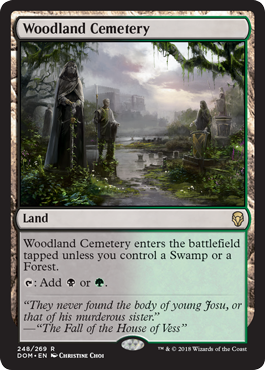 If you are playing swamps, I don’t even know how powerful this card would really be for you in limited. It can add a lot of mana in the late game but a lot of mana might be overkill at that point. 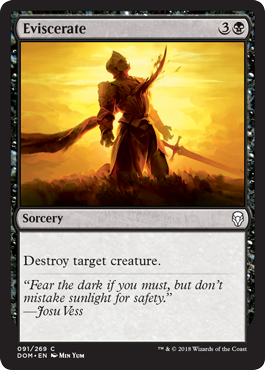 That being said, I think you should almost always play it if black is one of your main colors. 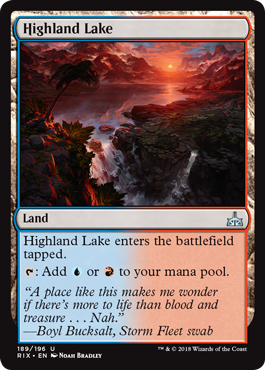 These rare lands are great mana fixing and they will usually not enter play tapped unlike other lands that make two colors of mana. 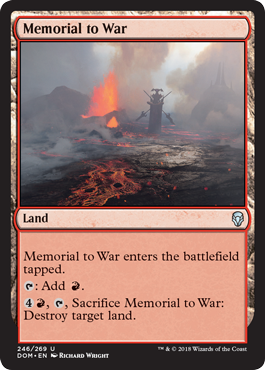 All the Memorial lands are pretty good except the red one. 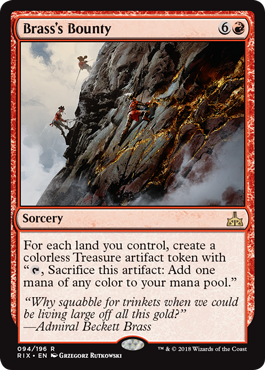 I would probably still play one over a mountain but it has the weakest sacrifice ability compared to the other lands. I probably wouldn’t play this over a land that produces the colors that I need. 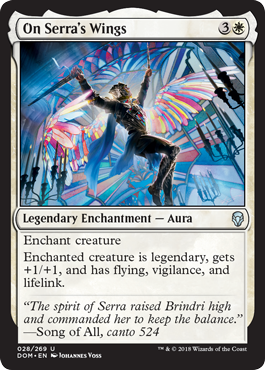 While it’s fun to analyze the cards and their ratings, I think this looks like a really fun set to play so don’t worry too much about what these numbers say and have a lot of fun trying out Dominaria! 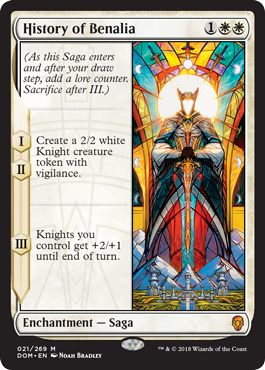 Let me know if you have any differing opinions once you try out the set; I can definitely be convinced to change my initial impressions of some cards. I hope you all have a great pre-release and thanks for reading! With only two weeks of 2018 behind us and with a new set coming out, I have resolved to start doing my own set reviews for the first time. I had never taken the time to review the cards myself and was always one to “learn on the job” when it comes to learning new cards, but it’s a new year – the traditional time to start putting new (good) habits into place. 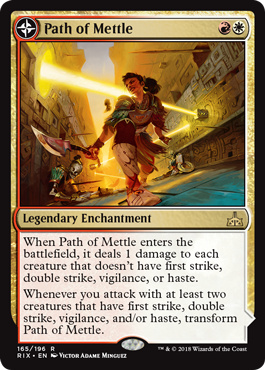 This won’t take care of the bigger threats, but it is so cheap and almost permanent unless someone is running a mainboard Naturalize effect. A great situation would be getting a smaller creature that your opponent suited up with an enchantment. 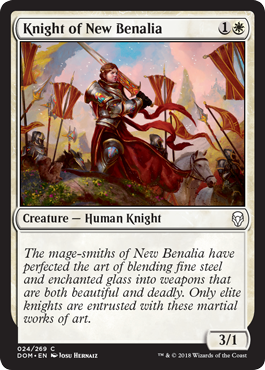 I feel like this card is so strong but I am also concerned about it only being a 1/1. 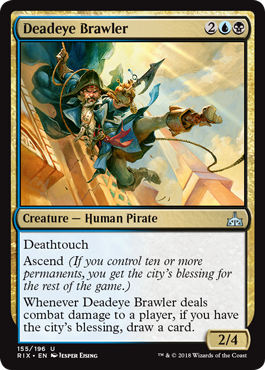 That being said, besides dying to a Skulduggery or ping effects, it seems powerful enough with the potential to swing games. 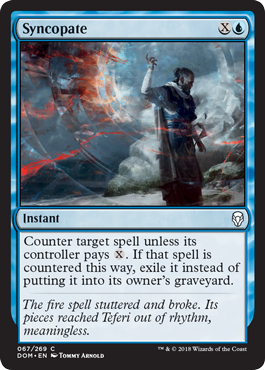 It is technically a removal spell, but I just feel like the conditions on this card is a little too high, even for removal. You can deal with one threat that is threatening your low life total, but what about the other ones? The upside is that it is only one mana though. I hope that my initial impression ends up being incorrect though, but this is where I have it for now. 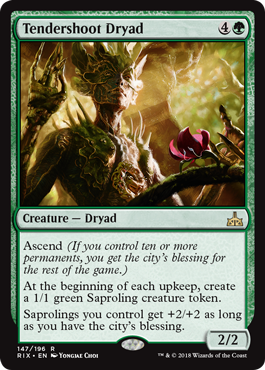 This is a great sideobard card and I can maybe even see people mainboarding it in Sealed (the same type of people who would mainboard Crushing Canopy in Sealed). 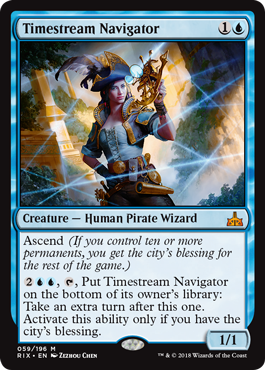 I personally am not a fan of putting cards like this in the mainboard but I wouldn’t fault anyone for doing so since there are a lot of enchantments in Ixalan block. 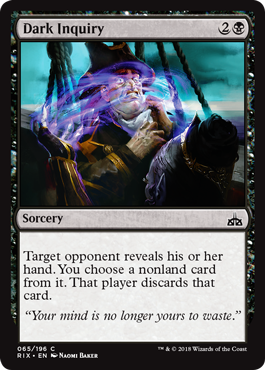 While this removal is conditional and people might play around it when you don’t play anything and pass on turn 4 with white mana up, the verdict is that it’s a still a pretty solid card. 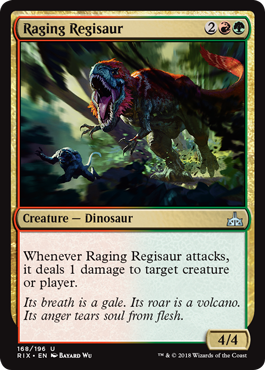 This card is going to be so annoying to play against, I am already upset thinking about it. 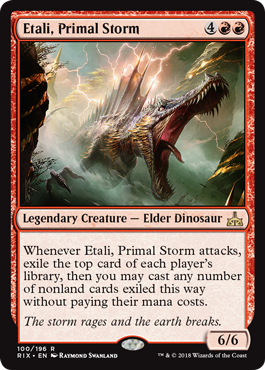 Good thing it isn’t super threatening as a 2/2 and there should be plenty of removal that can deal with it, but face a deck that can give this creature some more power/toughness and you can’t find your removal spells and you’ll understand why I’m upset. 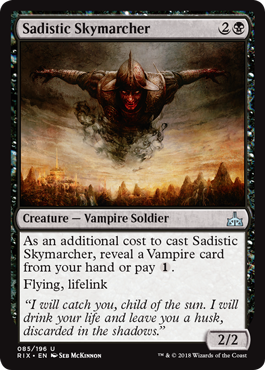 A fair price to pay for a 2/3 flier and bonus: it’s also a vampire. 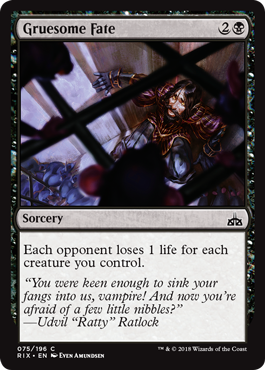 In a vampire deck with lots of lifelink, this card doesn’t have any downside. 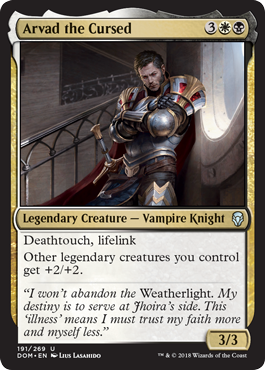 I don’t see it having too much downside in a R/W aggro list either though. You can either attack for 3 and get in aggressively and maybe get to attack with it again down the road after a Pious Interdiction. Or it can be a very annoying turn 2 road block for your opponent. 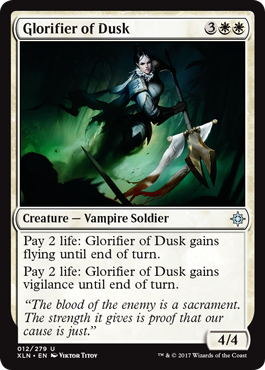 I think this is a solid card in a vampire deck, finds that bomb vampire card you opened and gives you a little bit of upside at a decent power/toughness and mana cost ratio. 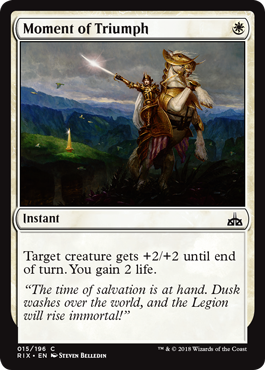 It is also fun to imagine a deck with multiple copies of this and Legion Conquistador. I feel like this card is a little below average for an uncommon but it’s definitely playable. I love that they reprinted this for Rivals. 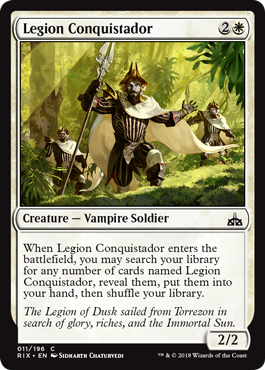 Now you still get 3 packs to pick up as many Legion Conquistadors as you can. 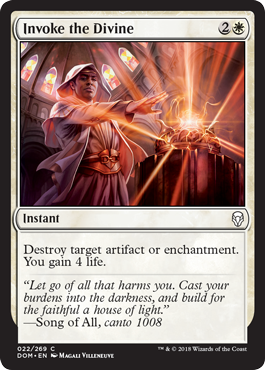 One mana cheaper than Pious Interdiction but without the life-gain upside. I’ll still take it. 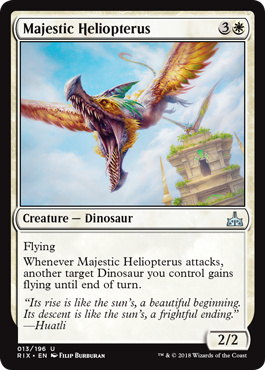 If you couldn’t pick up a Cobbled Wings for your Dinosaur deck, this card will help you out in that front. However if you need help from behind, this might not be the card you hope to draw. 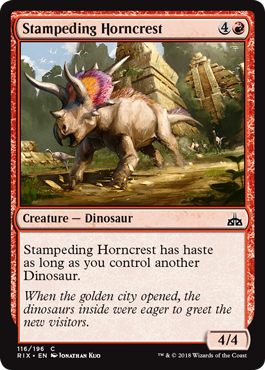 I love these kinds of 2-drop creatures – creatures that no one is happy to trade off a real card for. 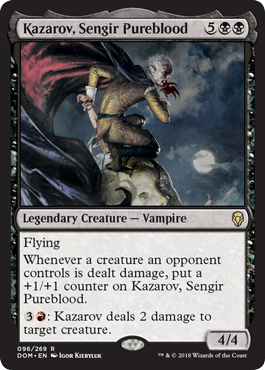 While I think Vampire’s Zeal is slightly better, this card is not too far behind it. 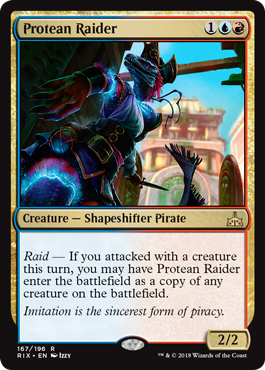 One mana tricks dominated in Ixalan Limited and Rivals is not looking much different. I’m not sure this is the kind of rare you open and want to first pick most of the time. 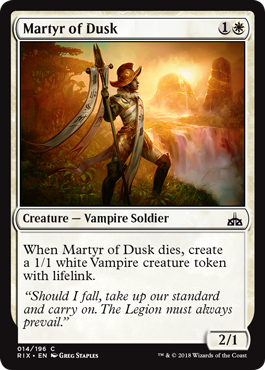 Losing life is kind of a tough scenario to set up in Limited (unless you have lots of Glorifier of Dusk type cards), especially if your opponent sees this on your side of the battlefield. 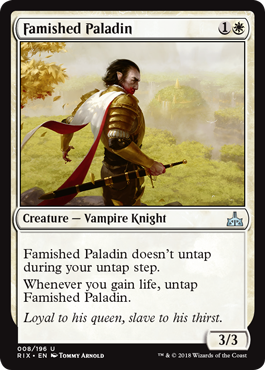 However, it does make it tougher for your opponent to attack you unless they are okay with your Paladin gaining a counter. 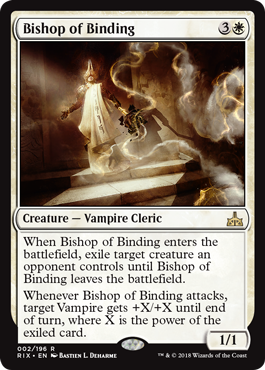 I think this is a card to watch out for – not just in B/W Vampires but any white deck. It’s cheap enough that it can be used as a combat trick if needed and a strong finisher when ahead. An anthem effect for only 3 mana is pretty exciting. 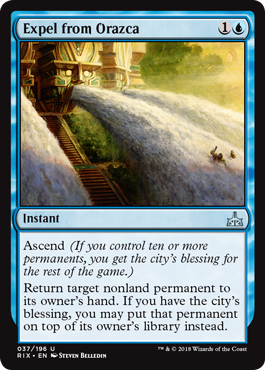 You don’t even need the city’s blessing for this card to be worth it. Assuming not much has changed, I still expect this card to be the go-to card to fill out the 2 drop slot. 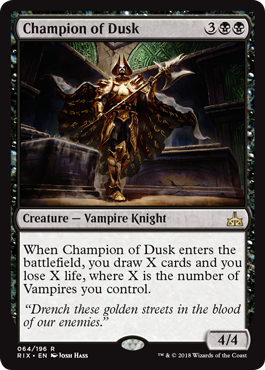 I tend to sideboard out this card when playing against a vampire deck. This is basically 4 mana for 4 points worth of power/toughness. 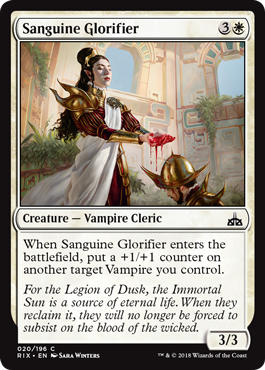 If you’re really struggling to find another Vampire then a 3/3 for 4 mana isn’t too bad either. 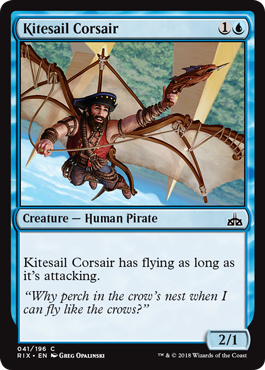 This is a cool card to have in your deck because it’s likely to have flying if you draw this later in the game. If you have it in your opening hand, it is solid too. 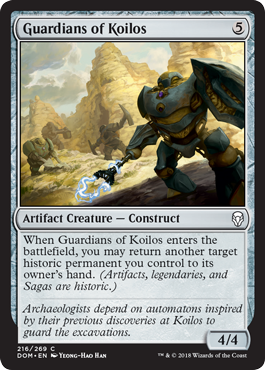 However, this card on its own will not likely be game breaking. 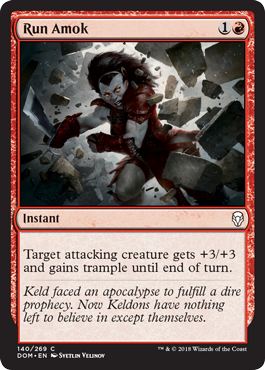 This is a brutal card to have at your disposal because you can plan the right scenario to play it. While this card will have its moments, there will also be some situations where it will not be as strong as you would like. It’s definitely not the kind of card you’re happy to play, but hey, it helps you block early if you need it to and isn’t totally dead in the late game. While +1/+1 isn’t a huge swing, granting something lifelink usually is. And it also comes with a bonus 1/1 Vampire! 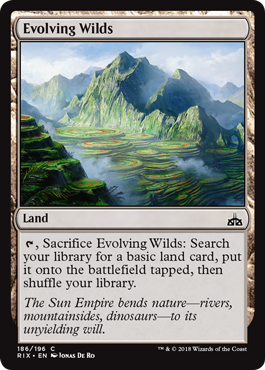 This card doesn’t even belong to any Ixalan tribes… but it will fill out that curve for you. You can play this and it won’t be terrible, but it also won’t be great. 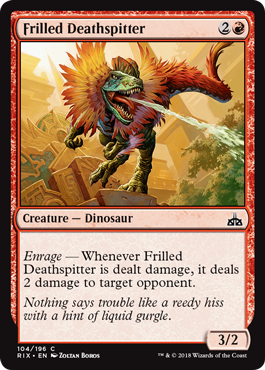 The “Save a kill spell to deal with this guy” Dinosaur that also lets just enough damage through to trigger enrage is pretty sweet. 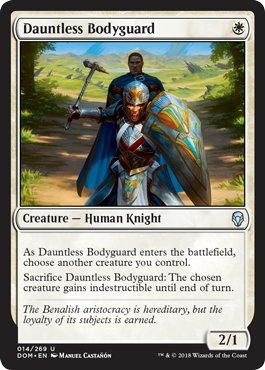 Well this card isn’t unbeatable, since it will return your stuff if you ever get it off the battlefield, but it’s not going to be fun to play against. 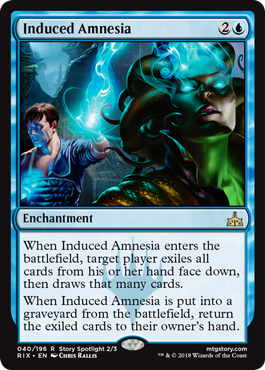 While I love cards like this, it will definitely hurt when you finally get to play it, and your opponent brushes it off with Luminous Bonds. 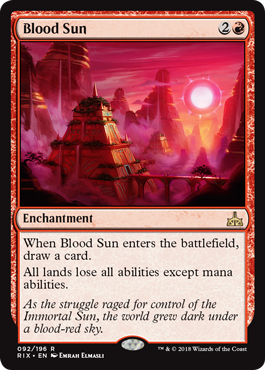 The Raid part of this card doesn’t add too much to the card, making it effectively still Cancel, but maybe you get to pay one mana once to get an instant your opponent tries to play. 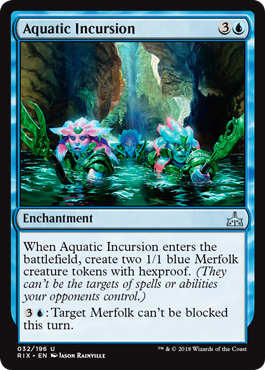 Paying 4 mana for 2 1/1 Merfolk is a little higher than I like to pay, but the upside of giving a Merfolk unblockable can definitely be a useful mana sink. This is not an easy card to evaluate but I think in general it will be around a 3.0, give or take. 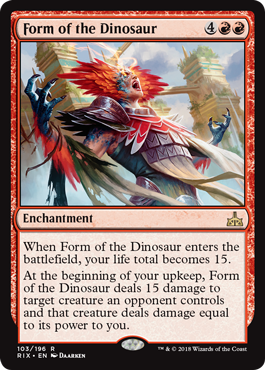 It can never be too terrible and if you manage to take your opponent’s 3/3 dinosaur token, then it’s great upside. However, I’m not sure it’s one of those rares that you’ll always first pick either. Solid card that replaces itself but nothing spectacular. What a curious card. I do think it can be pretty good, although it is bad when you are behind. Oh yes, the after-combat bounce-a-creature. 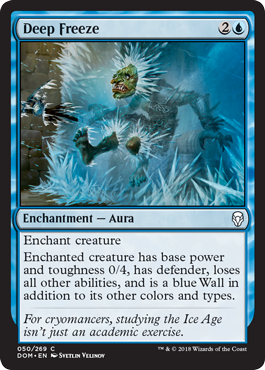 Will be good if you’re trying to get rid of an Aura and can generate some tempo advantages. 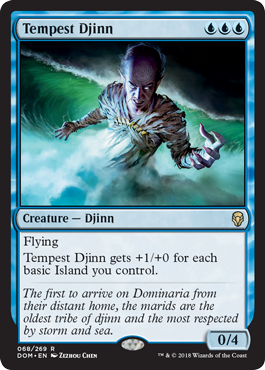 Speaking of tempo, this card is all about that. I am a little stuck on giving it a 3.0 or 3.5 but since there are so many Auras in this set, I think it deserves the upgrade. 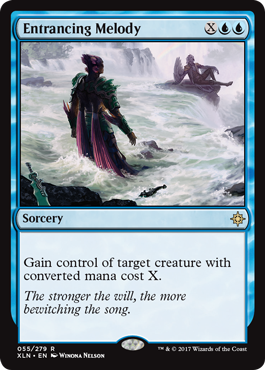 I am usually not a fan of these effects, but it can function as an additional removal spell if you’ve already used one earlier or maybe you want that second Entrancing Melody. 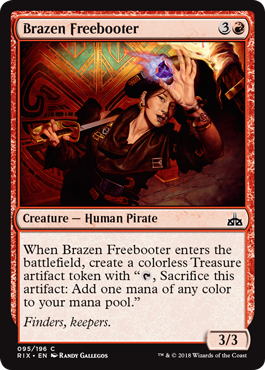 Basically another Cancel effect, but this time, you get a treasure which is kind of a great upside. 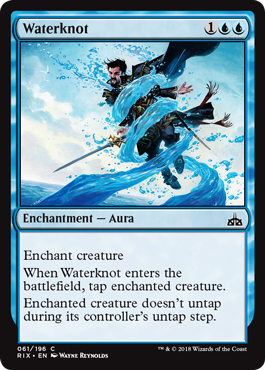 You can potentially play that 5 drop on turn 4 and get rid of your opponent’s creature, which is why I like it a little more than the rare Cancel of this set. 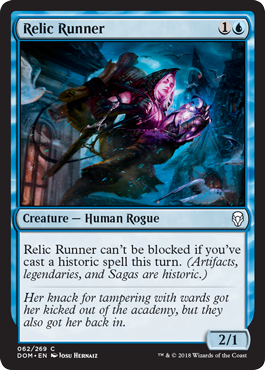 This card just doesn’t really impress me that much… I can see maybe dumping a weak hand and hopefully get a better one, but that doesn’t even seem great. Just your solid 2 drop with upside. 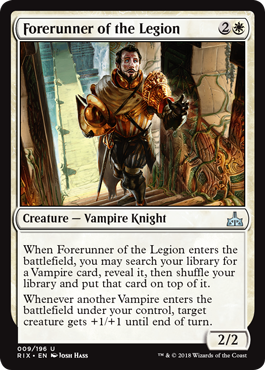 This guy gets around those pesky 1/1 Vampire tokens as well. 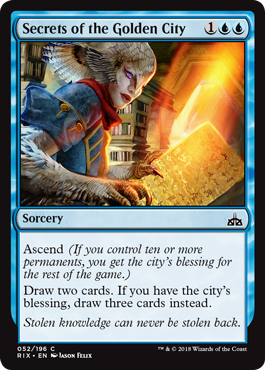 You really want the city’s blessing with this card, but once you have it, 2 new cards a turn should really solidify the game into your favor. This might not be able to catch you up if you are behind though. 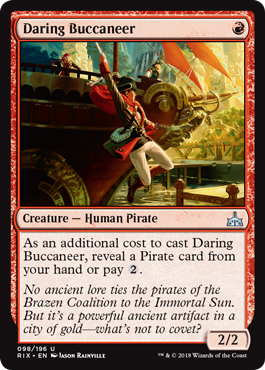 I know Ixalan is all about those 1/1’s for one mana but I still wouldn’t take this super highly unless you’re in that specific strategy. 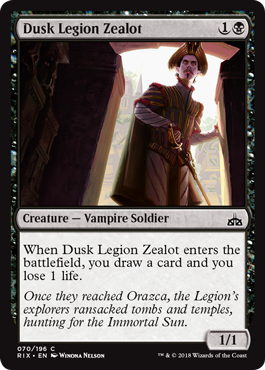 Mostly a sideboard card in my opinion. 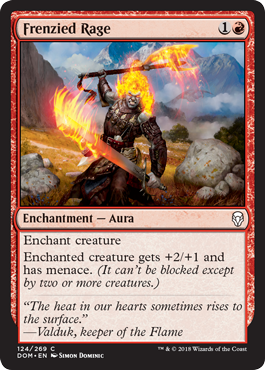 But it can hit a lot of annoying cards, especially if you see a lot of removal or enchantments from your opponent. Well, my fear of the depths of the ocean just got worse. 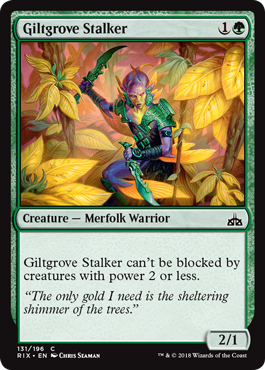 It’s going to be very hard to get rid of this card if your opponent is careful about hoarding cards in their hand. I mean, with this on the battlefield, do you even really need those cards in your hand? This isn’t a rare I would be excited to open or first pick, but it is a decent card that has a lot of flexibility. 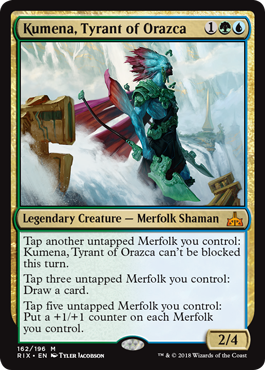 Not your first choice 3-drop Merfolk, but it’ll do to fill out your curve. This card is extremely interesting and I feel like it’s powerful (seeing 3 cards deeper into your deck must be good, right?) but I can also see that I could be potentially overvaluing it. 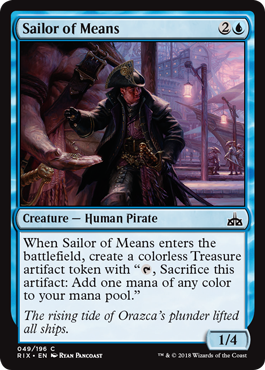 I know Sailor of Means seems kind of like an average card, but I think it’s slightly better than that. 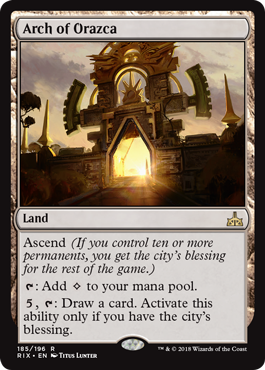 Being able to potentially use 5 mana on turn 4 is huge upside and even if you don’t use it, it can help towards gaining the city’s blessing. I like this trick because it’s cheap and flexible. 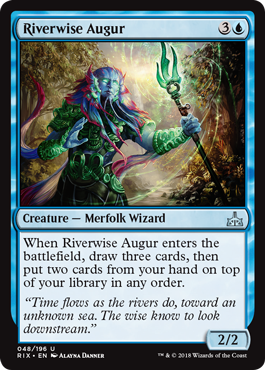 Definitely a solid card to open that will make you want to try drafting Merfolk. 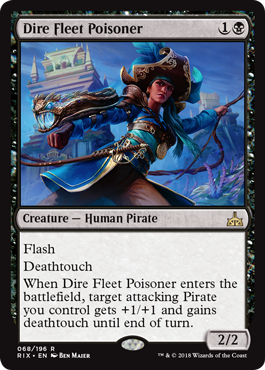 While it’s better than Pirate’s Prize, I don’t know if Ixalan is the right Limited environment for a card like this since it tends to be more aggressive. When you get this out on turn 2, it’s going to feel pretty unfair to your opponent. This is just a solid uncommon priced at the costs you’re willing to pay. 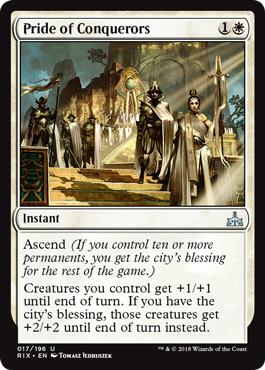 While the upside of having the city’s blessing is great, it is still something to play on turn 3 if you need it to be. I mean, sometimes you are missing that top-end curve…. 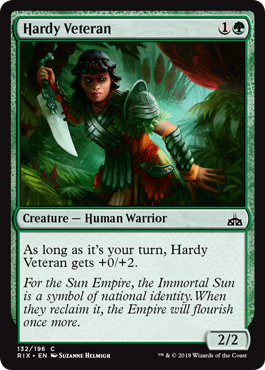 On a more serious note, I know some people are higher on this card than I am because of its similarities to Jade Guardian. 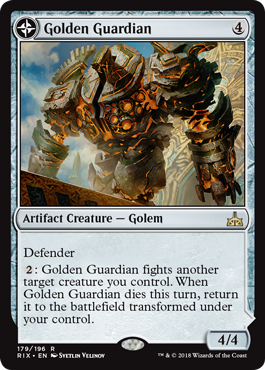 However, it is a lot worse than Jade Guardian and I tend to look at cards based on their floor and not their ceiling. 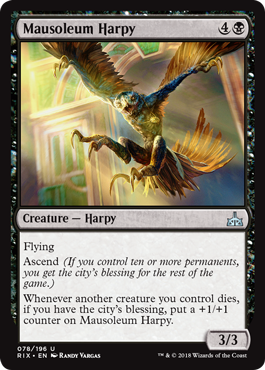 When you get the city’s blessing, it’s worth it, but I think it will usually be a 2/3 flying for 4 mana and that’s okay. 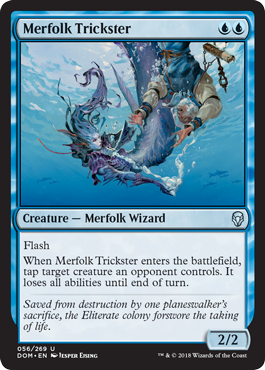 There’s always one of these… but hey, it’s a 2-drop Merfolk so you might end up playing it if you need to. 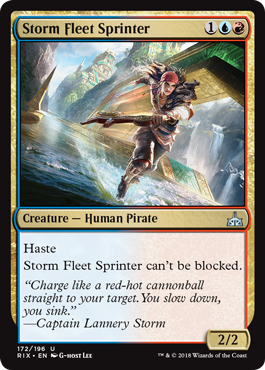 I don’t think I would consider this card a bomb in Ixalan limited because it’s kind of slow and being a 1/1 is quite vulnerable, but I think it is worth playing if you happen to pick one up. A solid rare to have in your deck. Basically a blue Luminous Bonds so I’ll take it. If I learned anything from Gerard Fabiano, it’s that he loves these type of cards. 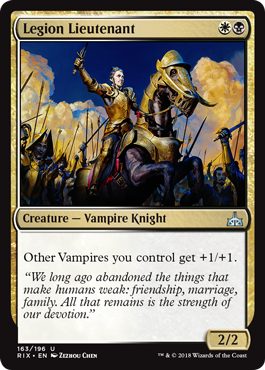 This is probably one of the better kind of these cards I’ve seen though and gaining life is not irrelevant for a vampire deck. I’m starting to run out of things to say about cards like these… you don’t really want them, but you’ll play them. 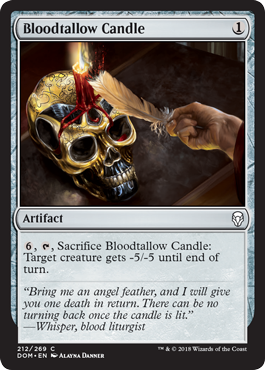 Opening this card will strongly pull me into drafting vampires. I feel like X can easily be at least 3 a lot of the time and that is being conservative. I think this is an above average card because the effect can be game changing but there is some set up and the cards you get are random so the result will not always be what you want or expect. 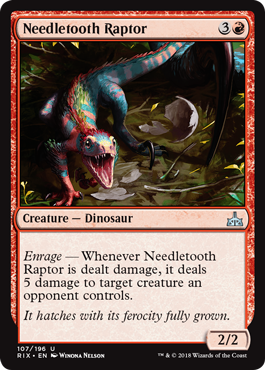 This is a good 2-drop when you’re playing against dinosaurs, but since the effect isn’t consistent, I don’t think it deserves the 3.0. 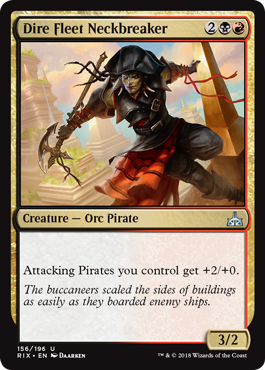 This will be tougher to play around since it’s a rare, but if your opponent is attacking in with a Pirate into your bigger creatures and it doesn’t make sense, try to keep this on your radar. 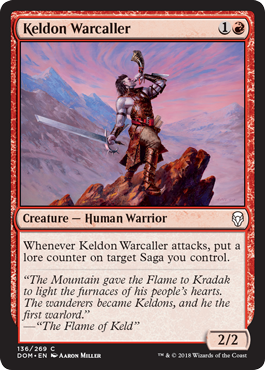 A decent card that gets better in the late game so it evens out to average to me. 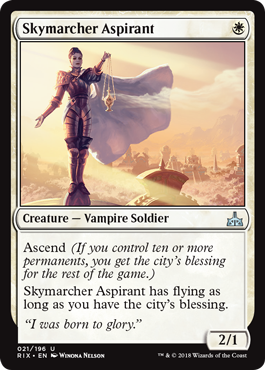 This card reminds me of Elvish Visionary and can definitely provide a bonus to cards such as, Champion of Dusk or Paladin of Atonement. A 3/3 for 3 usually deserves a 3.0. 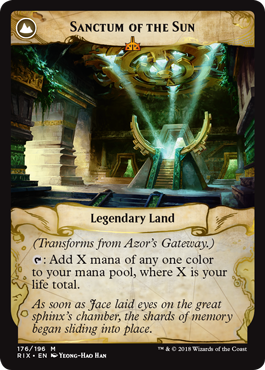 Similar to the white forerunner, it will fetch a rare out of your deck and give you a little bonus while being a decently costed creature. 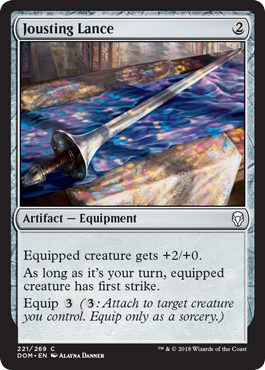 Even though it is a sorcery, I still think this is a solid uncommon and can really swing games in your favor. Some decks just won’t be able to recover after you cast one of these. 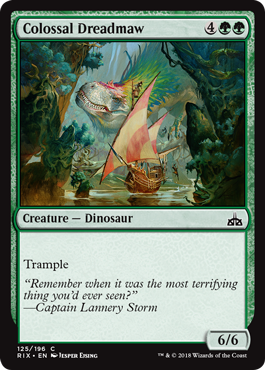 If Ixalan has taught me anything, it’s that this card is more playable than I would normally assume. 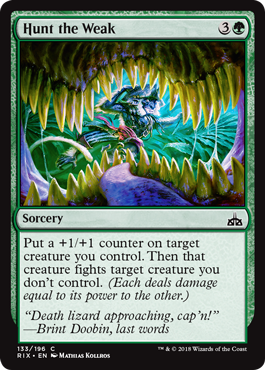 If you have lots of creatures, why don’t you just kill your opponent with them rather than play this card… I can potentially see bringing it in against board stall matchups if you really need to push those last points of damage through, but I’m reaching when I say that. Sweet and to the point. The type of common removal spell you might pick over some rares. 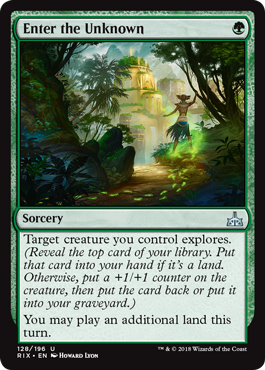 I am not a huge fan of cards like these, but I can see people playing it in Sealed if they have a really good bomb to search for. 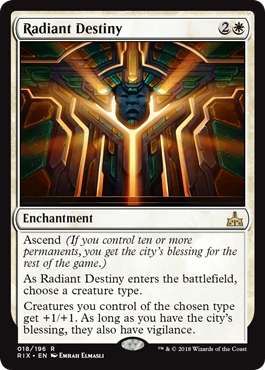 Since this is more of a late game costed card anyway, you will likely have the city’s blessing when you play it. Even if you have to fire it off early, the creature stats are still decent. This is a great trick and I don’t know about you but combat tricks that lower power/toughness are always more frustrating to fall for than combat tricks that increase power/toughness for me. 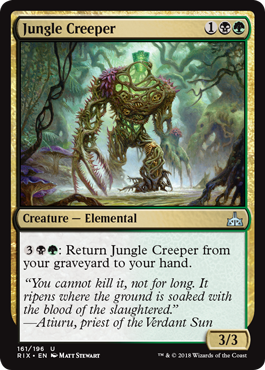 I am a huge sucker for creatures that can be returned from the graveyard to the battlefield and this one is even a 2-drop. 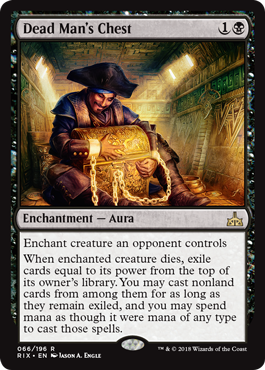 Your creature’s death will give you treasure but unless you’re intending to follow the Treasure Map or Revel in Riches, the treasure usually won’t be doing too much once you get to certain point in the game. 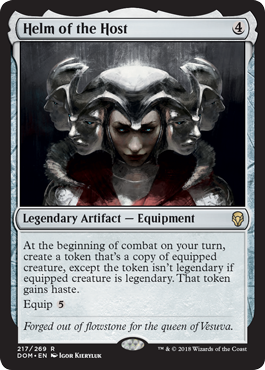 This is probably my favorite uncommon of the set and it is a very good one. 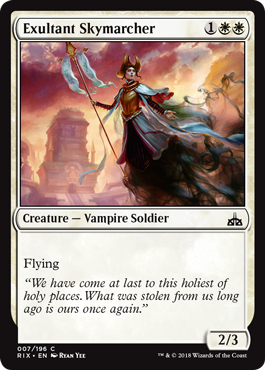 Remember when Sand Strangler was first-pickable in Hour of Devastation? 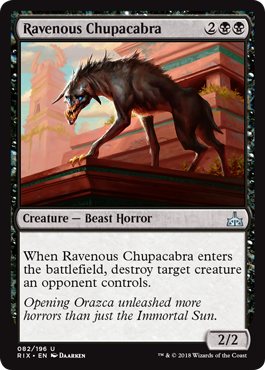 Well, this Chupacabra is easily first-pickable as well. This is basically a slightly upgrade Vanquish the Weak but I’ll take it. This is not a terrible card, but it’s not a great one either. 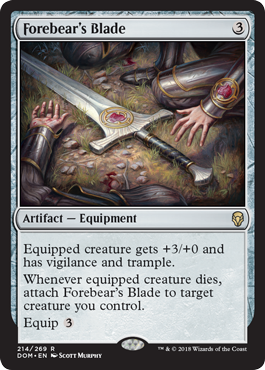 I am usually not a fan of these cards because there is set up involved and doesn’t immediately impact the board. This card on turn 3 feels almost unfair. 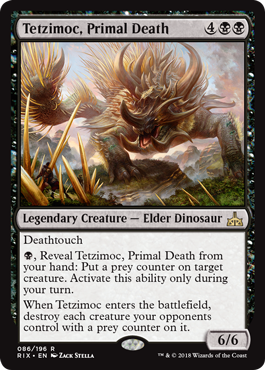 Even though your opponent will see Tetzimoc coming from you revealing it, it is extremely difficult to play around his ability. If they don’t have a counterspell, Tetzimoc gets to live up to its name. If you explore and hit a land you don’t want, you can discard it to explore again. Basically every explorer’s dream. 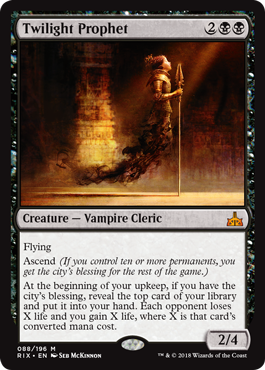 You should hold out until you get the city’s blessing (which is pretty doable in a vampire deck), because this card is more than worth it. Probably the best reward for having the city’s blessing in this set. 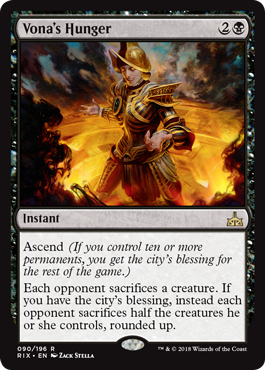 Having your opponent sacrifice a creature at instant speed is useful, but you also get to wipe half their board (albeit the weaker half) if you hold out for the city’s blessing. Just a solid playable 3 drop for any vampire deck. There is some fringe case where you bring this in against Legion’s Landing or something, but this is not a card for Limited. 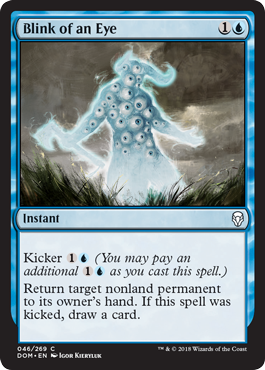 Even though it can only hit creatures, 3 mana for 4 damage is a pretty sweet deal in Limited. You are really going deep if you play this and I’m sure it will be awesome, but generally, I would avoid trying to do too much. 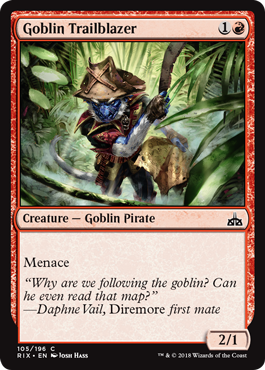 While I’m excited about being able to ramp from 3 mana to 5 mana, 4 mana to 6 mana is a lot less exciting and this card is just average. A nice flexible trick and would be rated a bit higher if it cost 1 mana instead of 2. 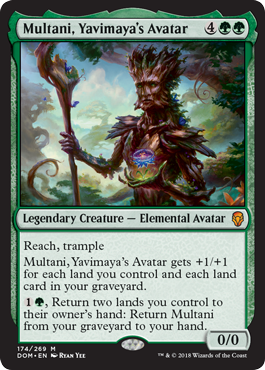 This is a great uncommon and good top end finisher for a R/W agro deck. A 2/2 for one mana is good, but 3 mana for a 2/2 isn’t the worst case either. You can run this creature out on turn 2 and it will be pretty strong, but if you can save it for later in the game to snag an opponent’s removal spell from their graveyard, that’s even better. If having a 6/6 on turn 6 isn’t enough for you, how about some card advantage as well? This card isn’t great, but it can definitely be annoying. Once it’s done getting in hasty damage, it will sit back and wait for an opportune time to be sacrificed. Out of all the forerunners we’re seen so far, I think this one is more powerful than the others. 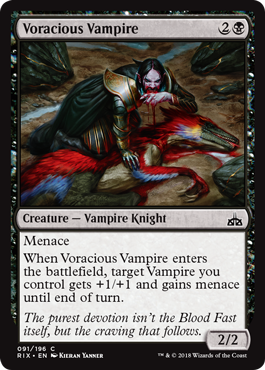 Dealing one damage to every creature has a huge effect on the board when there are 1/1 vampires and enrage abilities running around. 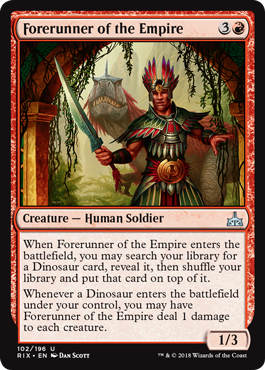 I’ve always wanted to be a Dinosaur, but this card has a lot of liability. Basically it’s nice to be a dinosaur when there are lots of smaller creatures around, but when you’re up against other big dinosaurs, it’s not going to be ideal battling them. I think it can be good in certain situations, but I probably wouldn’t first pick this rare. Just your average playable dino. 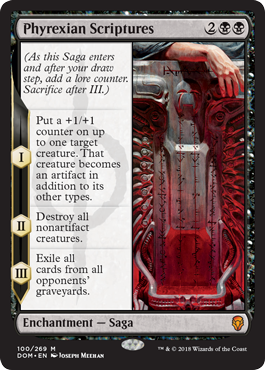 A 2/1 won’t be very menacing after the first few turns but it’s just a decent 2-drop to have. This will get rid of your opponent’s smaller creature for the low price of one mana but it does require some set up. 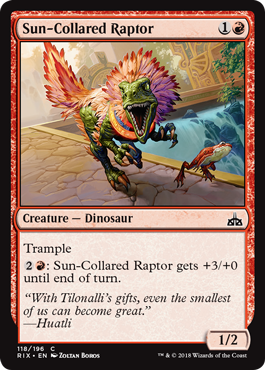 This is a feisty little dinosaur and if you can rile up this raptor somehow, you get a huge payoff. It’s a Grazing Whiptail without reach but I’ll still take it. 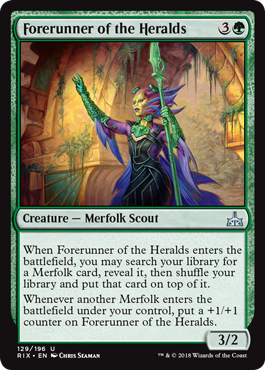 Not a terrible card, but it’s not really what I want to be doing in this set personally. One mana that kills a creature and potentially triggers an enrage ability for you. Very cost effective and can result in some blowouts. 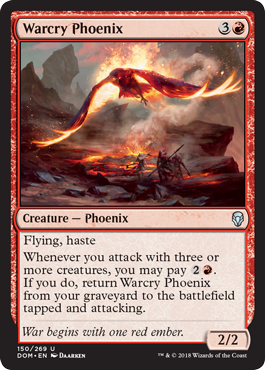 4 mana for a 4/3 flier is a great deal and if it ever hits the graveyard somehow, your opponent needs to find another way to kill a creature (albeit a small one) unless they want to deal with the Phoenix again. 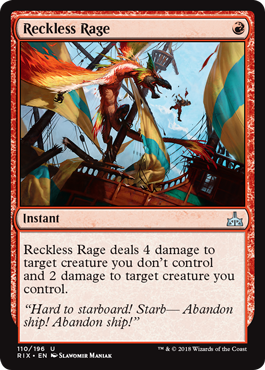 This is going to get in a lot of damage early and great for any red aggro deck. 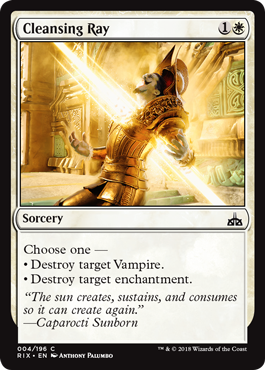 At worst, this card replaces itself, and at best you can kill lots of vampires and trigger your enrage abilities. 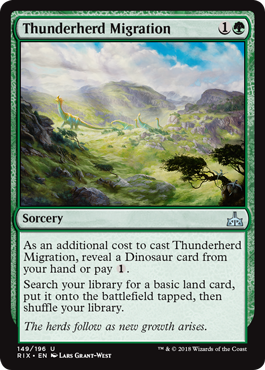 While these dinosaurs are pretty beefy, they cost a lot to cast and getting your opponent to sacrifice a couple of lands isn’t enticing enough to justify the cost either. 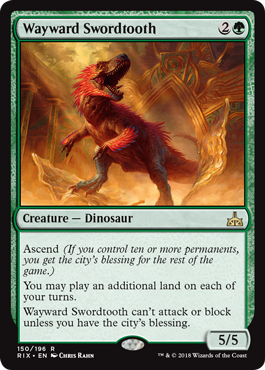 It’s not a bad top end for an aggro dinosaur deck but it’s still pretty average. A nice 2 drop 2/2 creature that becomes effectively a 4/2 creature in the late game. 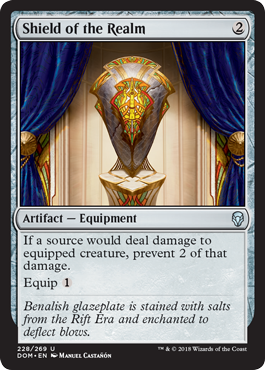 This card is not a great blocker early (and hopefully you won’t be blocking too much if you’re playing it) but it has a decent mana sink so it won’t be useless if you draw it later in the game. This is the definition of an average card. 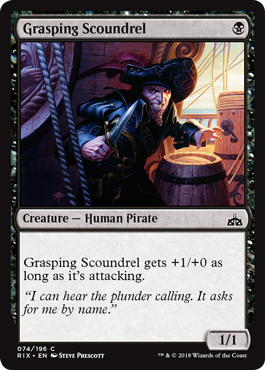 Not only does this card have my favorite flavor text of this set, it’s also a solid common. This isn’t the best aura but it grants a lot of power and ideally triggers a good enrage ability. This is a great mana sink in the late game for a red aggro deck. Can trip combat trick. Say that five times fast. 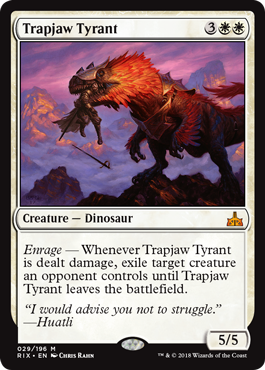 The enrage trigger can give it pseudo-vigilance or you can untap a land to generate a small mana advantage. At worst this card is a 2 mana 2/1, but if you get a good Pounce to happen, that’s a great bonus. 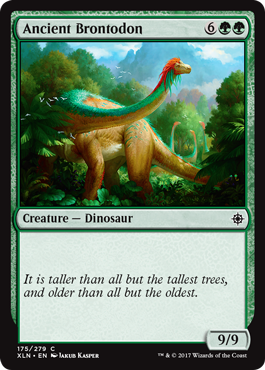 Still a solid common, still colossal and somehow, just as mana efficient as some of the Elder Dinosaurs. When you pay 5 mana for a total of 6 power/toughness, it is a huge advantage. Also, this is my favorite card art in Rivals. 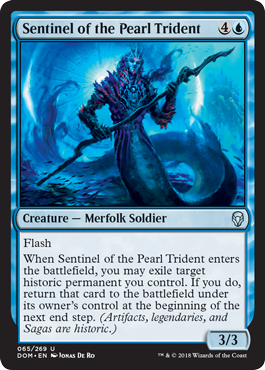 This is a solid rare in a merfolk deck and getting to choose which merfolk gets the counter can help diversity your threats. I really like this card but it is kind of hard to grade. It’s very cheap, helps you ramp a little bit, and you also get to explore. 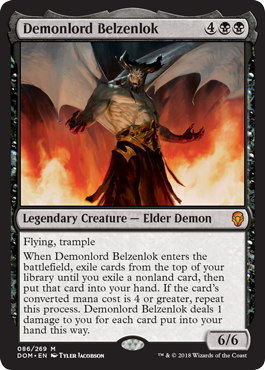 There’s really no downside, but it does take up a slot in your deck and I’m not sure where it falls in a draft pick. Another solid Forerunner. 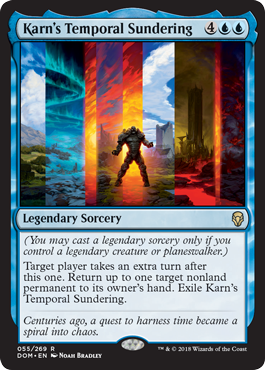 I feel like if you see these forerunners passed around a draft table, they might be a strong signal that a certain archetype is open. 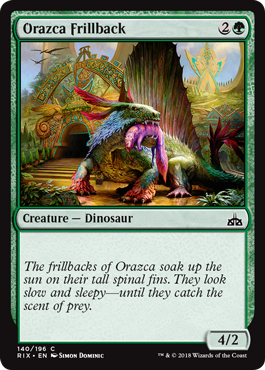 If your green dinosaur deck has a couple of Orazca Frillbacks, you can have a 12/12 as soon as turn 5. That’s a total of 20 power on the board on turn 5! Then again, a 12/12 will be sizable almost every turn of the game, so whenever you get around to it, it will still be quite strong. This can get in some early damage but it is a pretty average 2-drop. 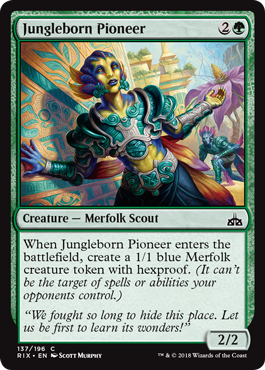 This is an interesting 2-drop and I think it’s slightly above average compared to other 2-drop creatures as 2 mana for a 2/4 is fairly cheap. A more expensive Savage Stomp, but still a decent removal spell for green decks. 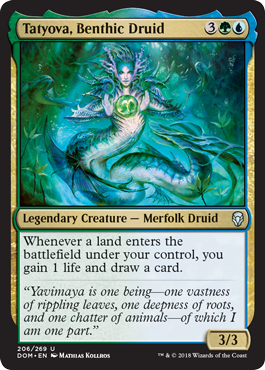 This card is trying to do the bare minimum to make your merfolk deck. I would say this is an average card and you would probably hope to find something slightly better. 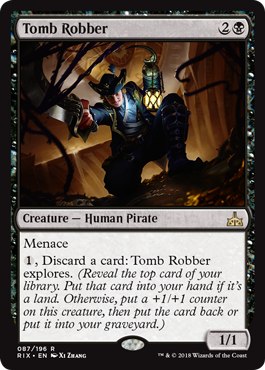 A card that lets you explore twice makes for a solid rare. 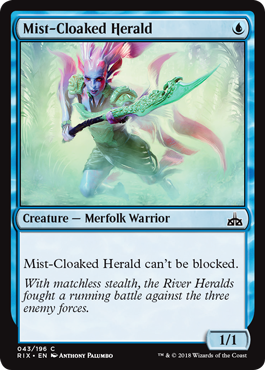 As usual, 3 mana for a total of 3 power/toughness is above average and now your merfolk army just got a little bit bigger. 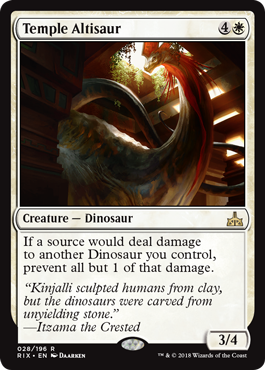 This card is slightly below average and making your dinosaurs a bit cheaper after turn 4 isn’t anything too exciting. 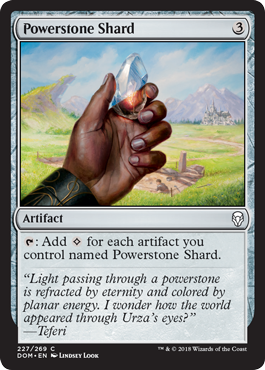 This is a sideboard card, but I think it might be maindeckable in Sealed since there are so many enchantments in this block. 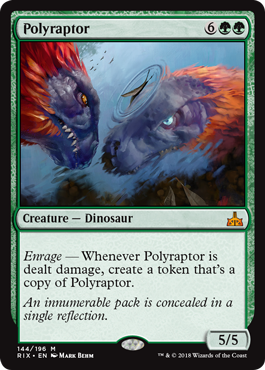 Basically Frenzied Raptor’s green dinosaur cousin. This is a solid 5-drop with a good enrage ability. 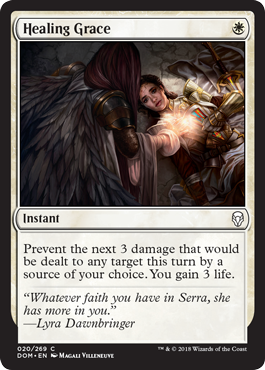 You usually don’t want to take a turn off to set up this card, but in Sealed I can see it being very useful. I don’t think it is a strong first pick in draft though. 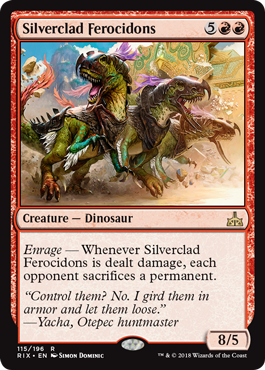 They’re just bringing back all the classic sideboard cards for this set. At 8 mana, you don’t really want a 5/5, but if you have something that can easily enrage it, well then now you have 2 5/5s that makes 5/5s and that starts to get out of hand quickly. Sort of an overrun ability and sort of not at the same time. 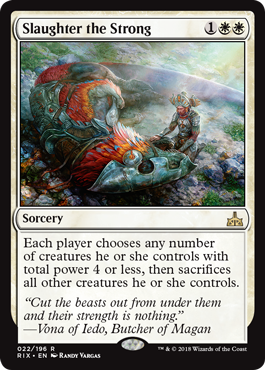 While you don’t get to trample over your opponent’s creatures, you do get a permanent +2/+2 which isn’t a bad trade off. 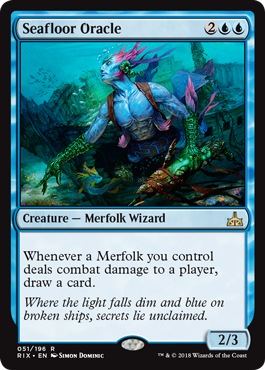 A trick and a 3/3 for 3 mana all wrapped up in one neat merfolk package makes a solid uncommon. 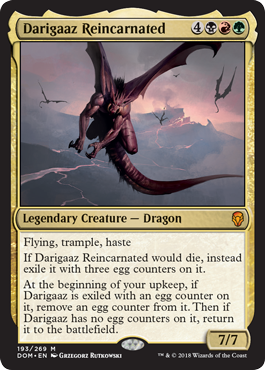 This is a solid rare and definitely demands an answer from your opponent. 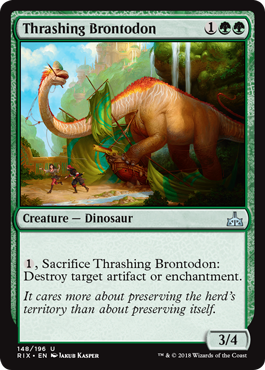 While this isn’t as big as the Ancient Brontodon, it is nicely costed and even has extra utility. Great ramp and fixing card, but not every deck is looking for this kind of effect. This card feels like a solid rare to me. 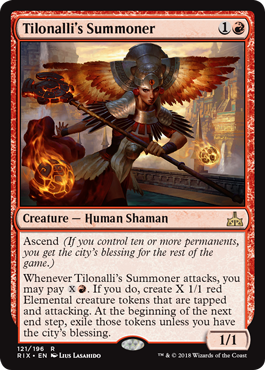 Basically, it’s an enchantment that lets you play additional lands each turn while also being a pretty effective creature for fight spells, and once you get the city’s blessing, it can attack right away. This is an interesting card but I don’t see its ability being very relevant in limited. 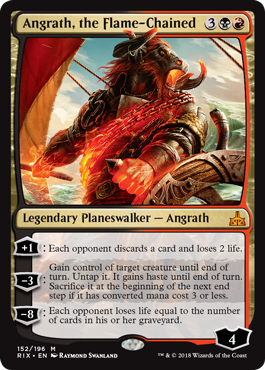 A Planeswalker is always tough to deal with in Limited and while Angrath can’t really protect himself, he has very relevant abilities for a B/R deck to take advantage of. 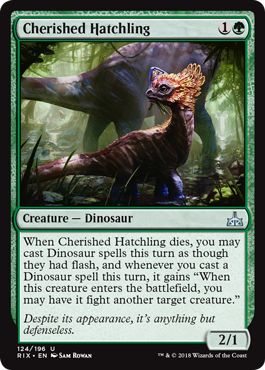 What a great card for any G/W or Naya dinosaurs deck. 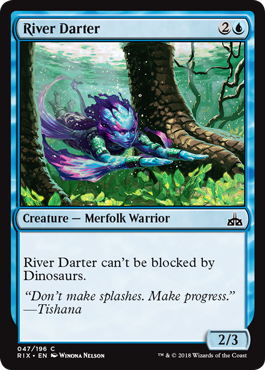 Getting back a dinosaur also makes this mana creature less of a dead draw in the late game. 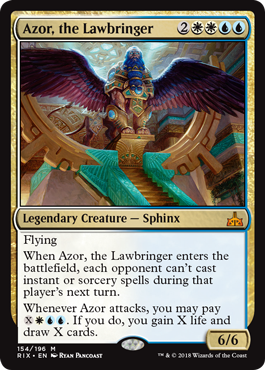 If you ever land Azor, unless your opponent has very specific answers, it will be very hard to stop you from getting a chance to activate its second ability which should gain you a huge advantage. 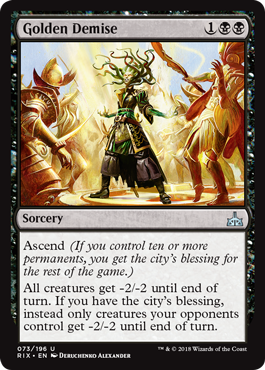 Even if you don’t have the city’s blessing, this card is still very good as a 2/4 Deathtouch creature. The best part about this card is that you don’t need to attack with it to get the bonus. While Elenda is fragile, she also has a huge upside and not much of a downside. 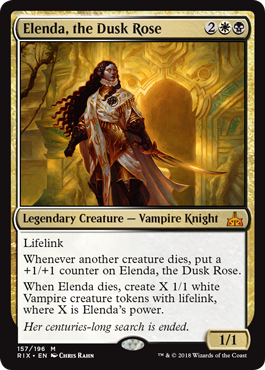 With her on the board, you can attack with your 1/1 vampires freely knowing Elenda will grow if they die and eventually replace those 1/1 vampires herself if she dies. 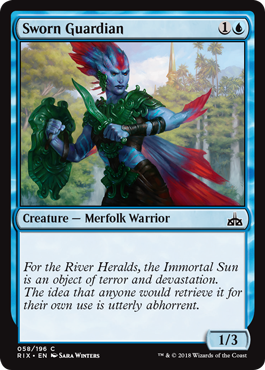 This is a solid rare in a merfolk deck. 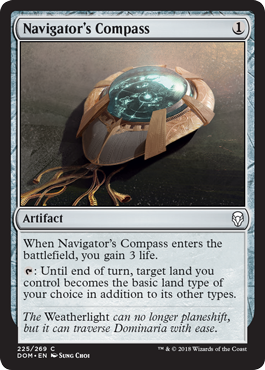 You can flip it as soon as it comes into play if one of your creatures already has two +1/+1 counters on it and its flipped side can end games very quickly. 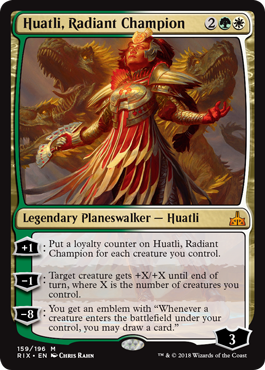 This Huatli is kind of a downgrade from the one in Ixalan since she can’t protect herself and requires you to have an established boardstate to be effective. 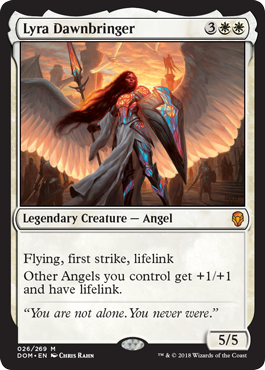 However, a Planeswalker is still a strong asset in Limited so I am still giving her a high grade. 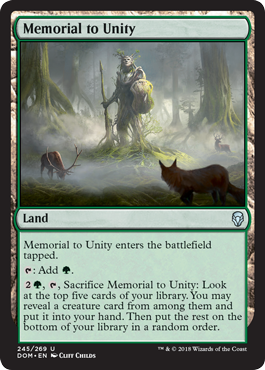 Getting to return any creature from your graveyard to the battlefield for 5 mana seems insane. You can even do this at instant speed! 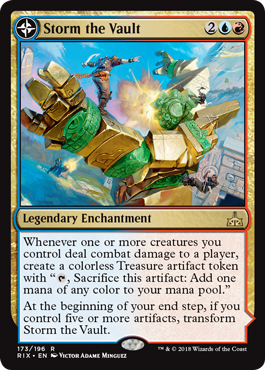 While this card is strong on its own, being B/G doesn’t give it a home all that often in this block and I’m tempted to give it a lower grade because of it. While the abilities are very strong, it does require you to have somewhat of a board presence to utilize them. 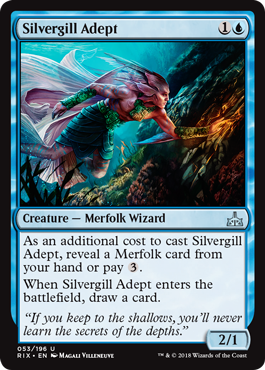 However, once you hit the sweet spot of 3 untapped Merfolk to draw a card, you should easily be able to overwhelm your opponent. 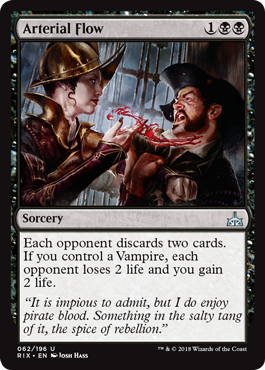 A very straightforward card that any vampire deck would be happy to have. 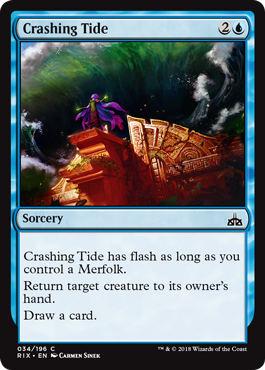 Basically the Merfolk version of the card above. 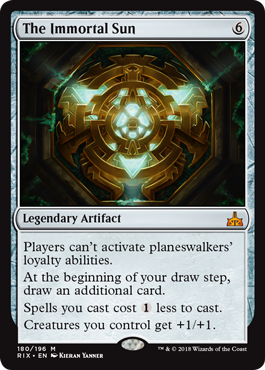 Probably the weaker of the Legendary enchantments as it isn’t as easy to flip and the flipped side isn’t as powerful as either. This card seems almost unbeatable. 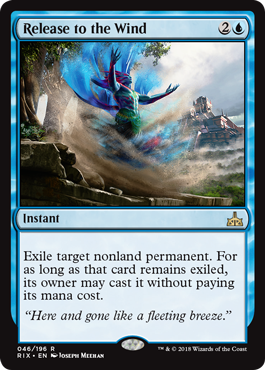 It is basically 3 removals in one card and then you get to cast the creatures you removed for free… While it is pretty slow and costs a lot of mana, I think it can help you get ahead when you’re behind. For the low price of 3 mana and attacking with a creature this turn, you can have any creature on the battlefield that you want. 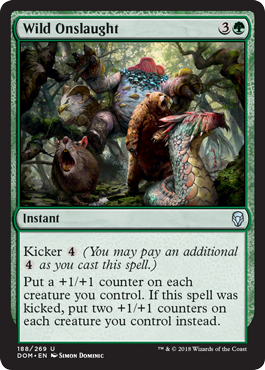 A 4/4 for 4 mana is very good and getting to trigger enrage/kill a creature/ping your opponent makes it a huge threat. Attacking/blocking each combat is a big liability especially when it has vigilance. 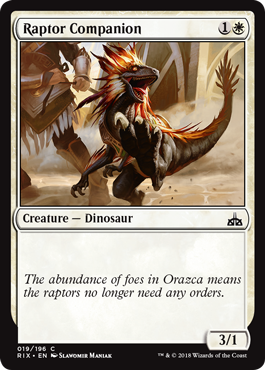 It will still be very good for a R/W deck but I don’t see this raptor staying alive for long. 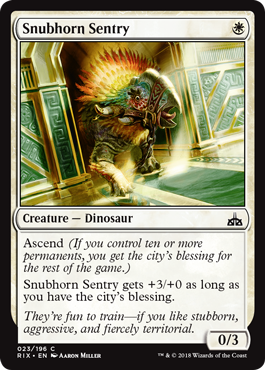 Even without the city’s blessing, it is still a decent card and once you get the blessing, it becomes a big threat. A solid rare but definitely not unbeatable. 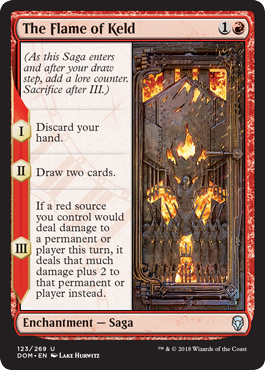 You’ll want to find ways to enrage it without having it die and luckily there are plenty of combat tricks in G/W to get it going. Haste and unblockable will make this a very fast clock. 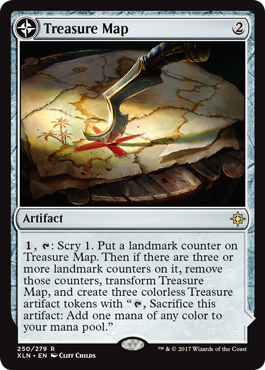 Nothing about this card excites me for Limited unfortunately, but there are some fringe decks that rely heavily on treasures to win so I’m not going to count it completely out. 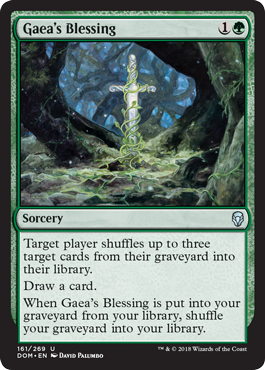 The only reason this card isn’t a 5.0 is because it costs 9 mana to cast, but that’s really the only downside… once you get it into play, there is a 99% chance (okay, maybe not true) you win the game. 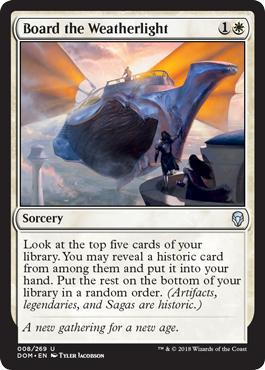 I hope if you do play this card that you see all your dreams come true, but usually in Limited, you don’t want to dream that big. 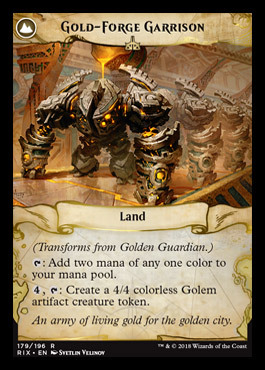 If you are playing this card, the goal is to not let it transform so you can keep looting through your deck. 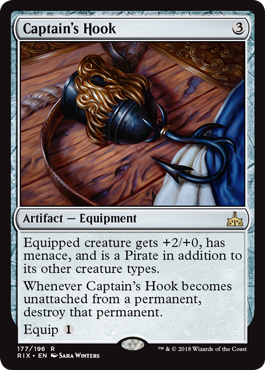 If you thought Pirate’s Cutlass was good, this Hook is definitely on par. 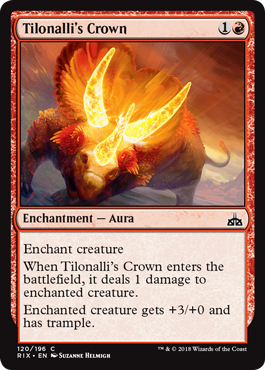 It is best on disposable 1/1 creatures. I don’t think you want to play these unless you were really struggling for 2 drops. 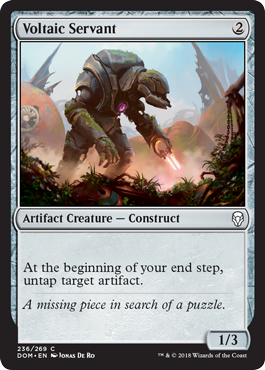 This is a strange card but it’s actually not too hard to transform, but you want to avoid losing a creature in the process. 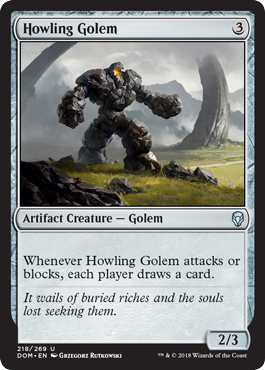 Being able to make 4/4 Golems for 4 mana every turn afterwards though might be worth it. 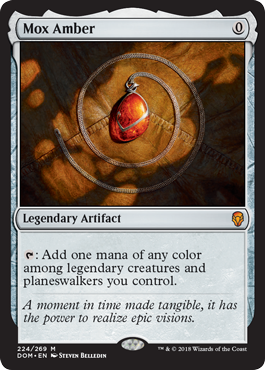 A colorless mana rock that isn’t completely dead in the late game isn’t bad, but it’s not what I would be looking to do in Ixalan Block limited. I guess you can play this to get to ascend faster? Not a bad equipment to have, but it’s not as exciting as the other common equipment in the block. A great way to get ahead in board stall games or when you’re slightly behind. Never exciting but also never bad when you need fixing. Also can help you ascend when you don’t need to find a land with it right away. This is a slow card but it does give you a payoff eventually. 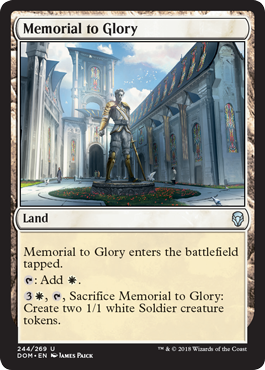 I would play this in a 2 color deck although that is a hotly debated topic and I would not look to actively take it in draft. Mana fixing is always nice even if it’s a little slower. Thank you for taking the time to go through my first set review! If you have any comments about how you would have rated a card differently or any feedback, I would love to hear from you. Have a great pre-release and I’m excited to go back to this in a couple months and see how my impressions have changed!